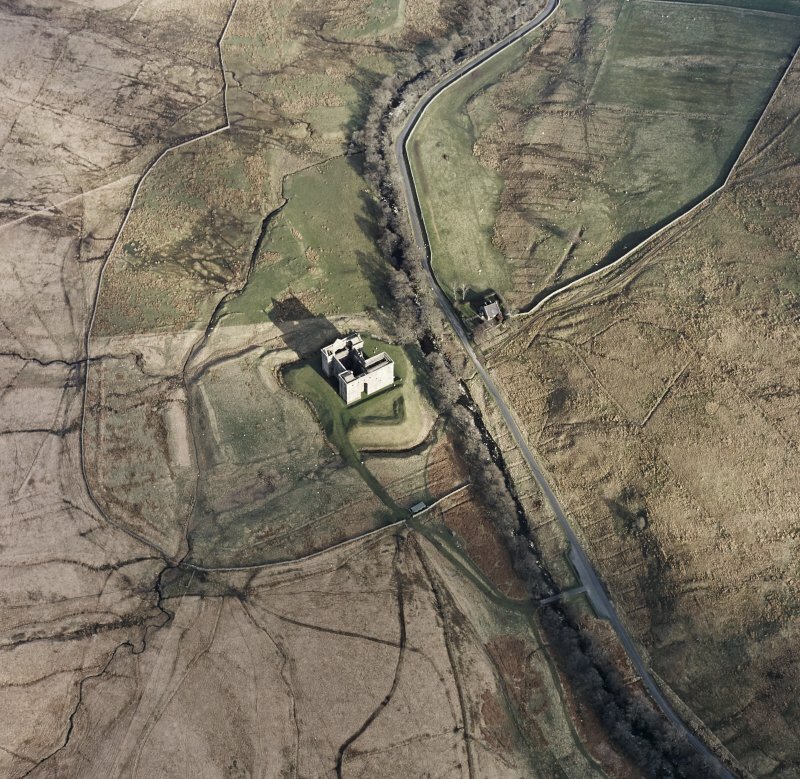 Oblique aerial view of Hermitage Castle centred on the remains of a castle with a chapel, boundary dyke and moated site adjacent, taken from the NE. 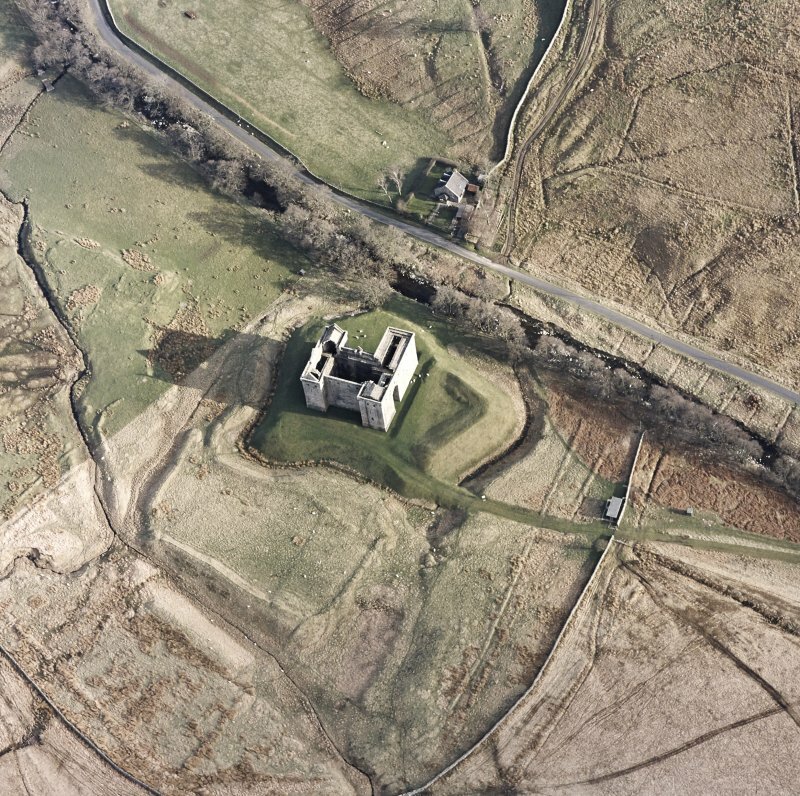 Oblique aerial view of Hermitage Castle centred on the remains of a castle, taken from the N.
Oblique aerial view of Hermitage Castle centred on the remains of a castle with a chapel, boundary dyke and moated site adjacent, taken from the NNE. 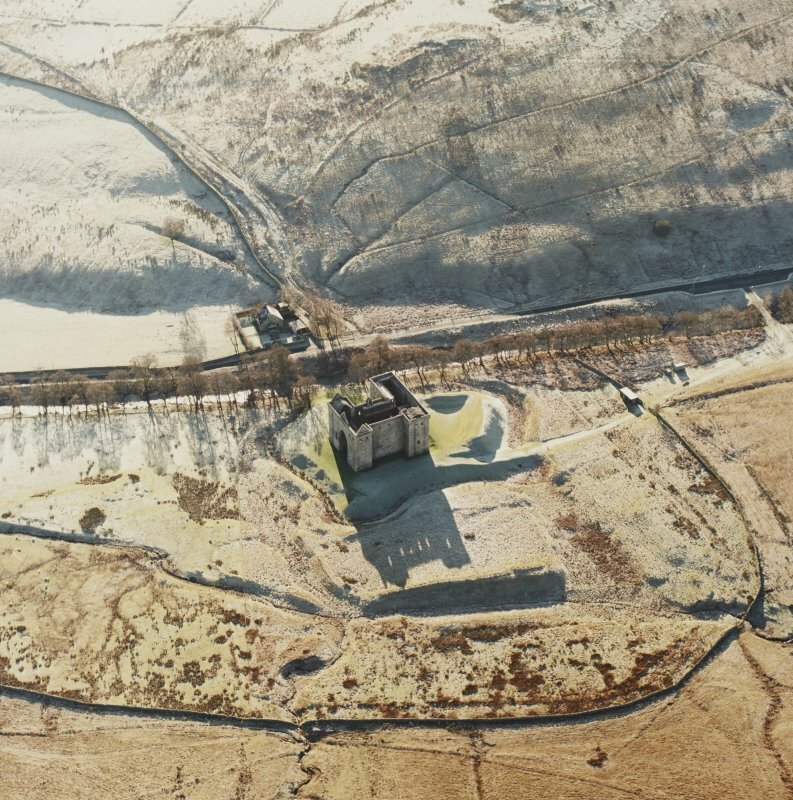 Oblique aerial view centred on Hermitage castle and moat, taken from the W.
Oblique aerial view of Toft Knowes centred on the remains of a field-system, rig and pens with a farmstead and quarries and a settlement adjacent and a castle in the background, taken from the SSE. 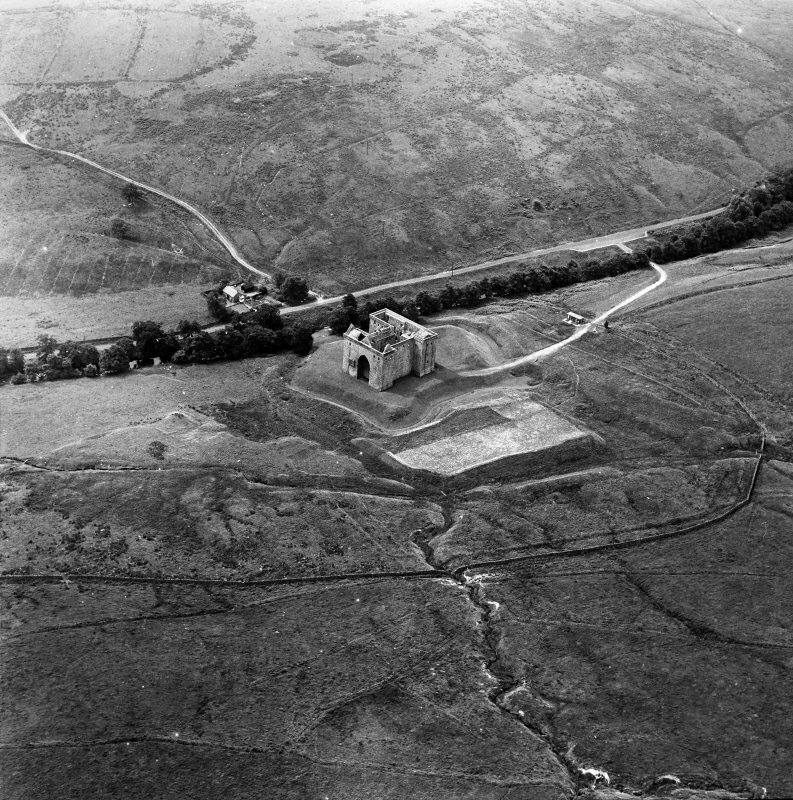 General oblique aerial view looking across the remains of the castle and chapel towards Hermitage, taken from the WNW. 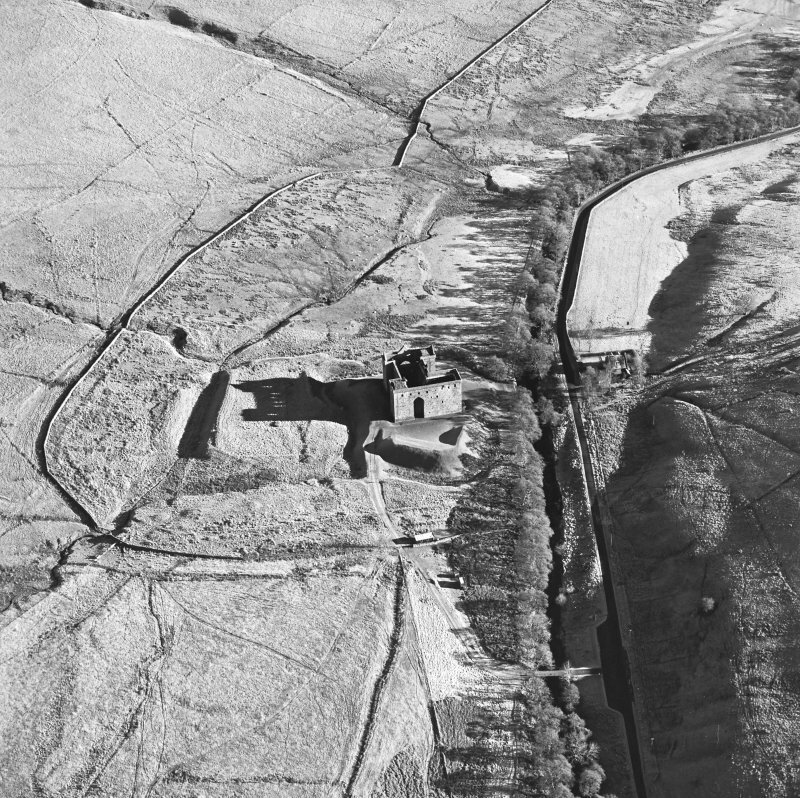 Oblique aerial view centred on the remains of the castle with chapel and moated site adjacent, taken from the NE. 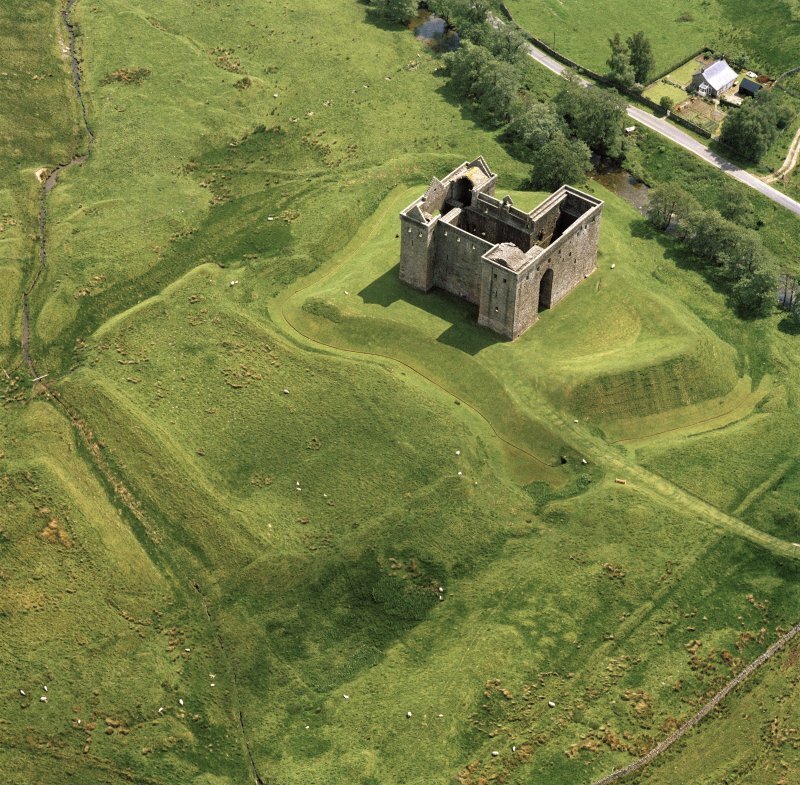 Oblique aerial view of Hermitage Castle centred on the remains of a castle and earthwork castle, taken from the NW. 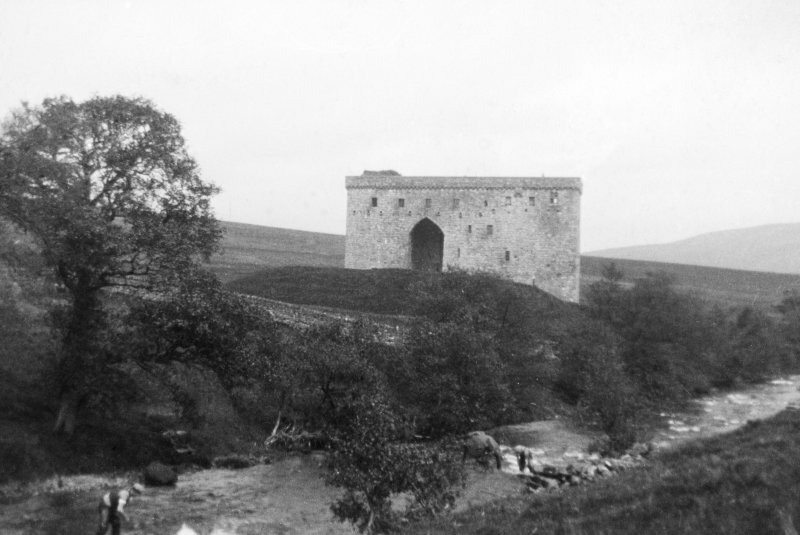 Hermitage Castle. 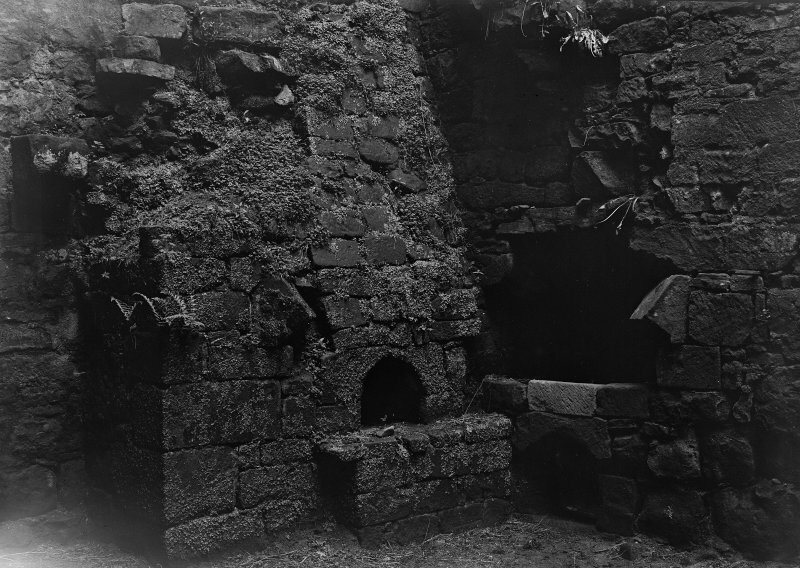 Photographic copy of etching showing ruin. 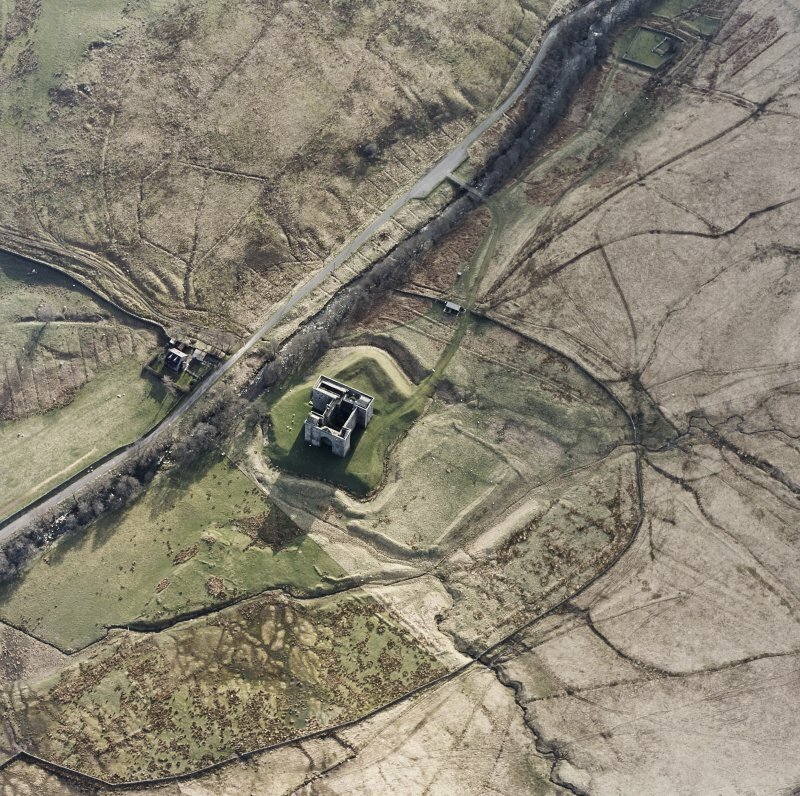 Hermitage Castle, oblique aerial view centred on the remains of a castle and earthwork castle, taken from the North West. 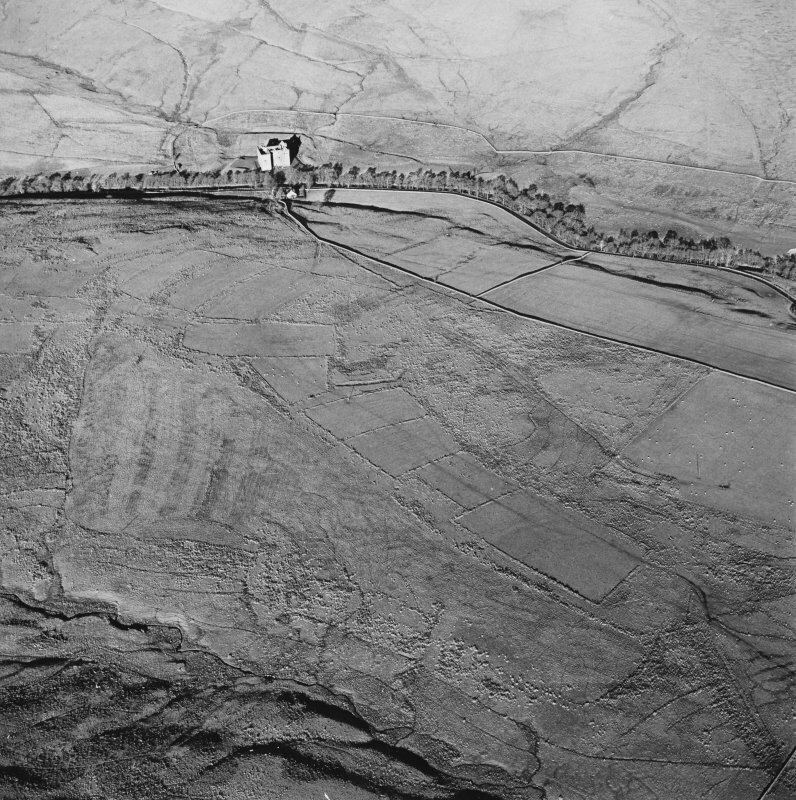 Oblique aerial view of Toft Knowes centred on the remains of a field-system, rig and pens with the remains of a farmstead, quarries and settlement adjacent and Hermitage Castle in the background, taken from the S.
Oblique aerial view of Hermitage Castle centred on the remains of a castle and earthwork castle, taken from the W.
Hermitage castle, oblique aerial view from the SE showing the outworks, early earthwork castle and the park pale in the background. 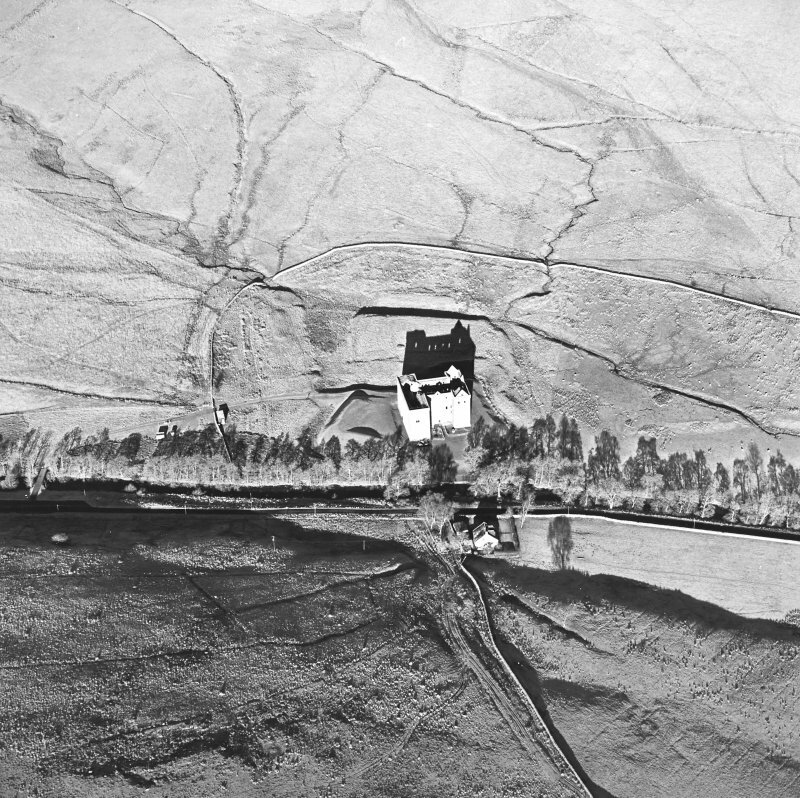 Oblique aerial view of Hermitage Castle centred on the remains of a castle and earthwork castle with the remains of a chapel, moated site and boundary dyke adjacent, taken from the E.
Oblique aerial view centred on the remains of the castle, chapel and moated site, taken from the SW.
Oblique aerial view of Hermitage Castle centred on the remains of a castle, taken from the S.
Interior of kitchen wing, SW tower..
Oblique aerial view centred on the castle and moat, taken from the S.
Oblique aerial view of Hermitage Castle centred on the remains of a castle and earthwork castle, taken from the S.
Oblique aerial view of Toft Knowes centred on the remains of a field-system, rig and pens with a farmstead and quarries and a settlement adjacent and a castle in the background, taken from the SE. 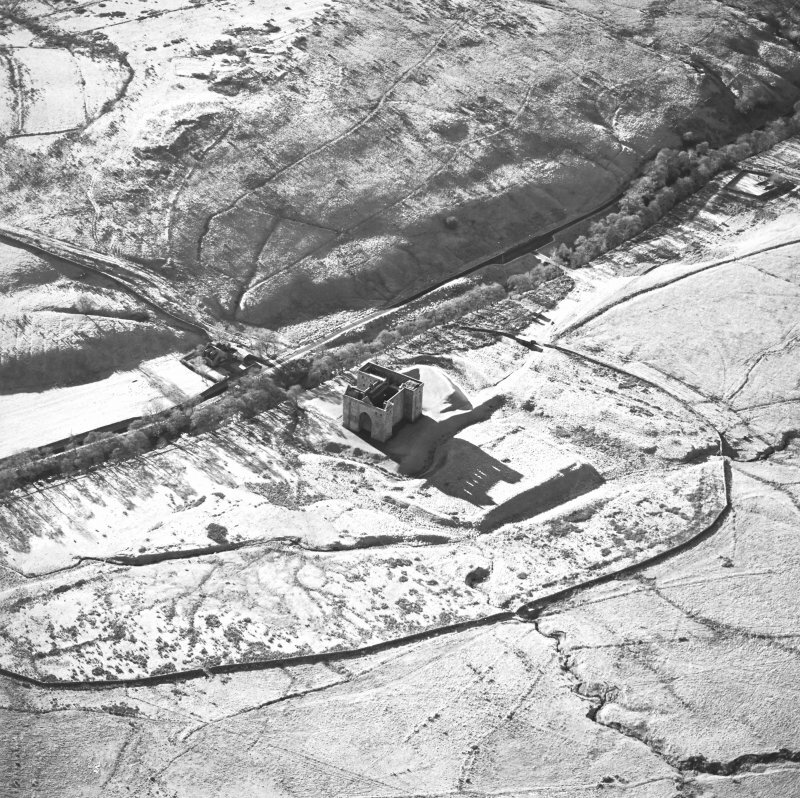 Oblique aerial view of Toft Knowes centred on the remains of a field-system, rig and pens with a farmstead and quarries and a settlement adjacent and a castle in the background, taken from the S.
Partition wall and built up fireplace. 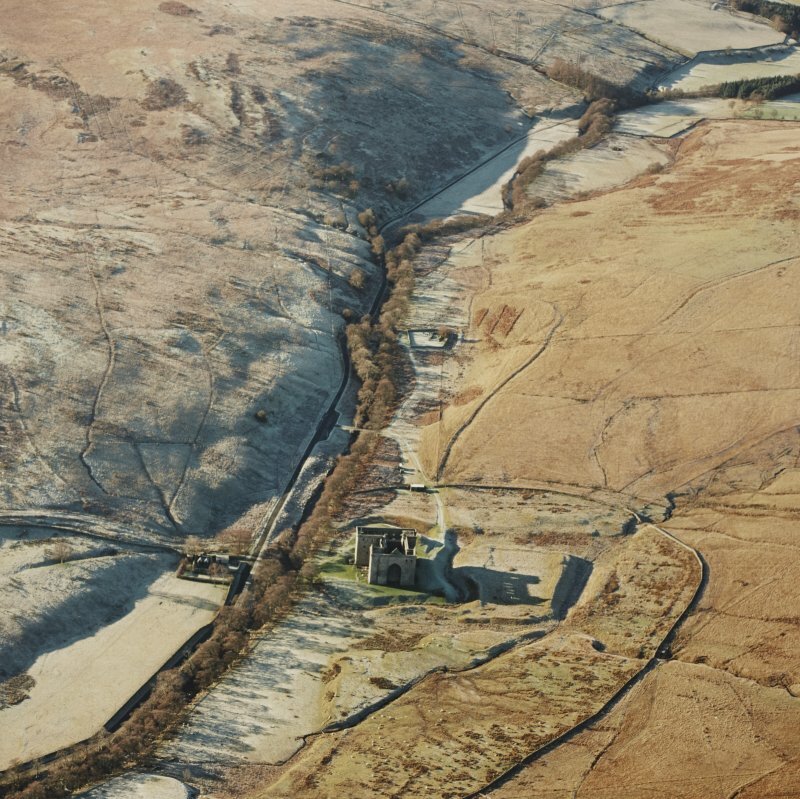 Oblique aerial view of Toft Knowes centred on the remains of a field-system, rig and pens with the remains of a farmstead, quarries and settlement adjacent and Hermitage Castle in the background, taken from the SSE. 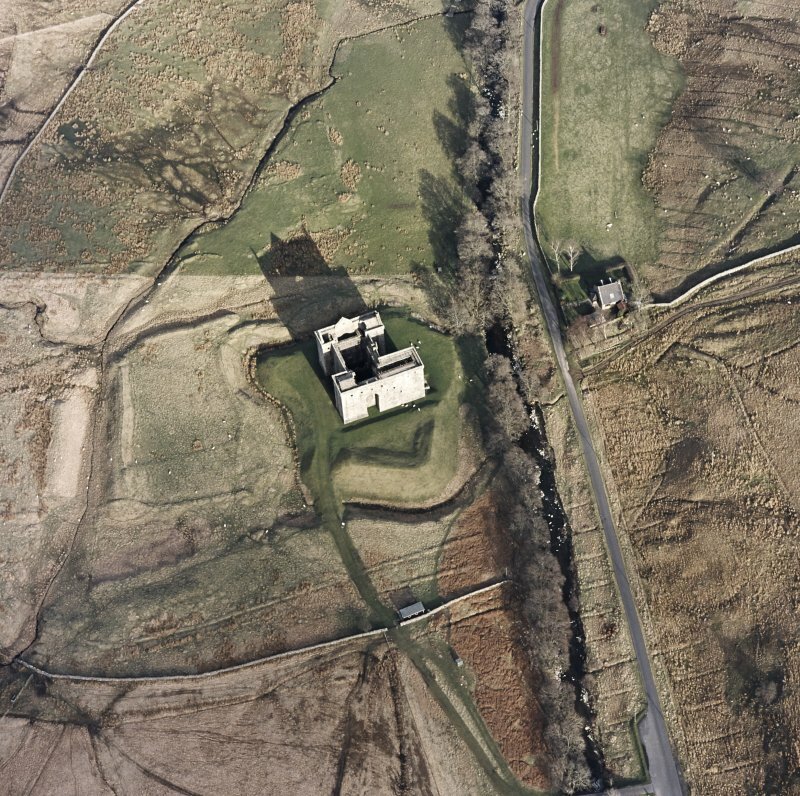 Oblique aerial view of Hermitage Castle centred on the remains of a castle and earthwork castle with the remains of a chapel, moated site and boundary dyke adjacent, taken from the ENE. 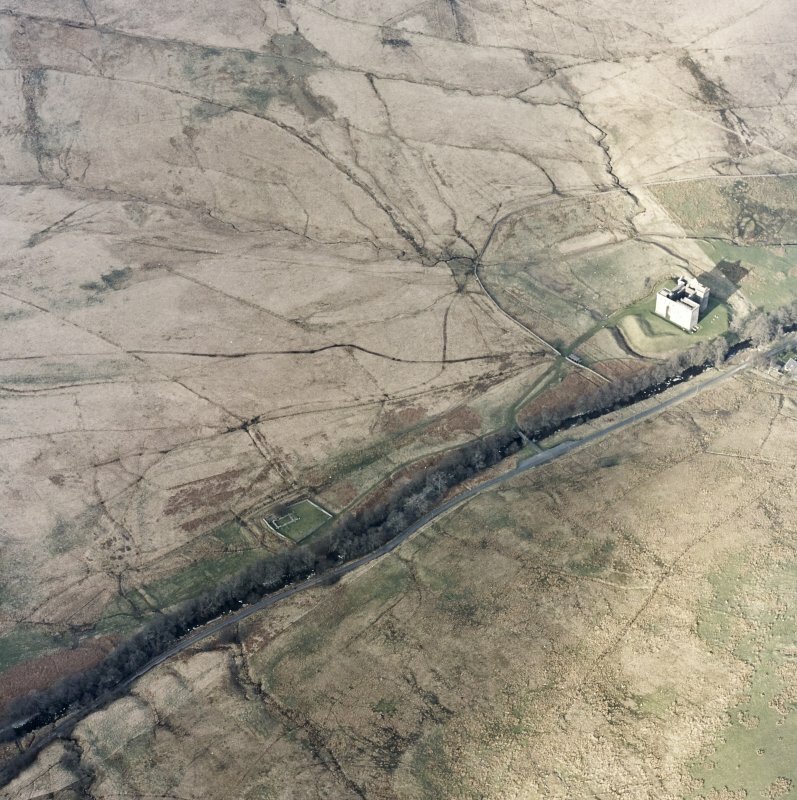 Oblique aerial view of Hermitage Castle centred on the remains of a castle and earthwork castle with the remains of a chapel, moated site and boundary dyke adjacent, taken from the NE. 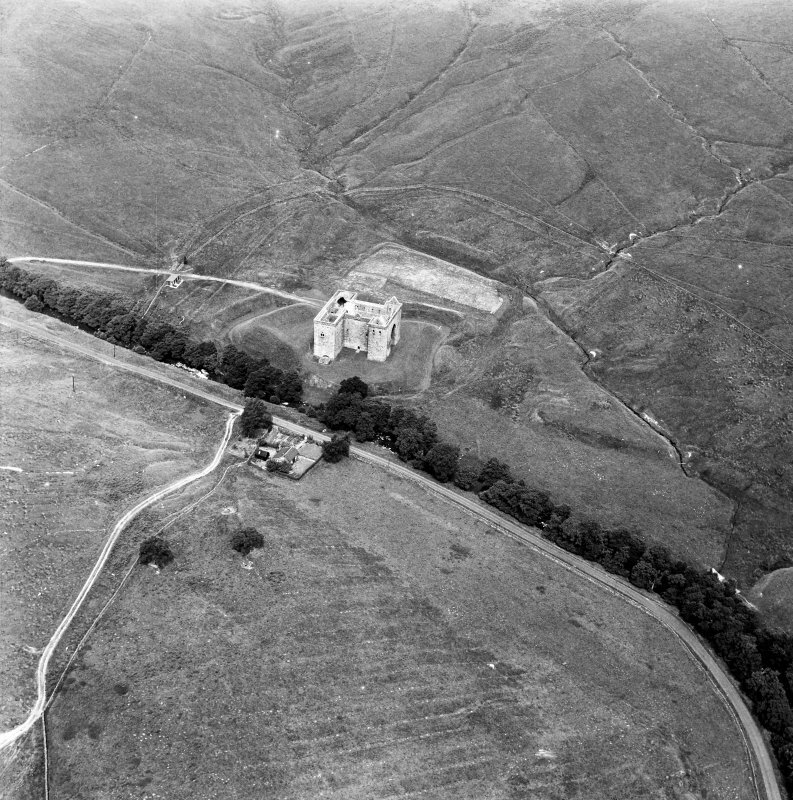 Oblique aerial view of Hermitage Castle centred on the remains of a castle and earthwork castle, taken from the SE. 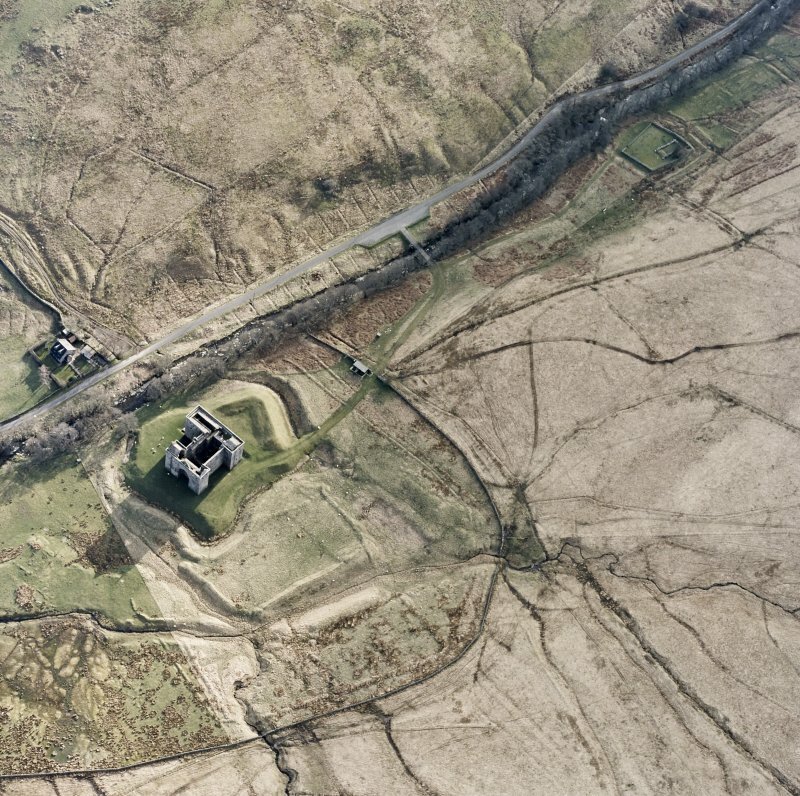 Oblique aerial view centred on the remains of the castle, chapel and moated site, taken from the NE. 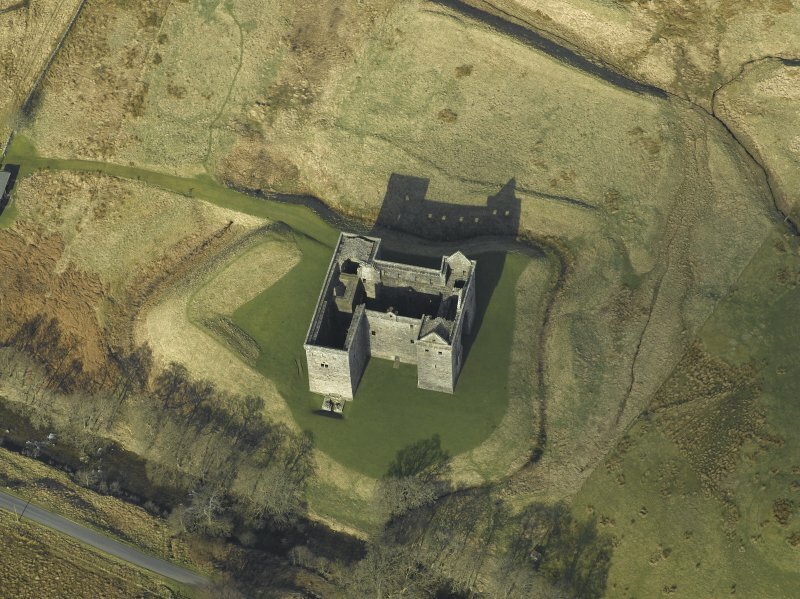 Oblique aerial view of Hermitage Castle centred on the remains of a castle with a chapel, boundary dyke and moated site adjacent, taken from the ESE. 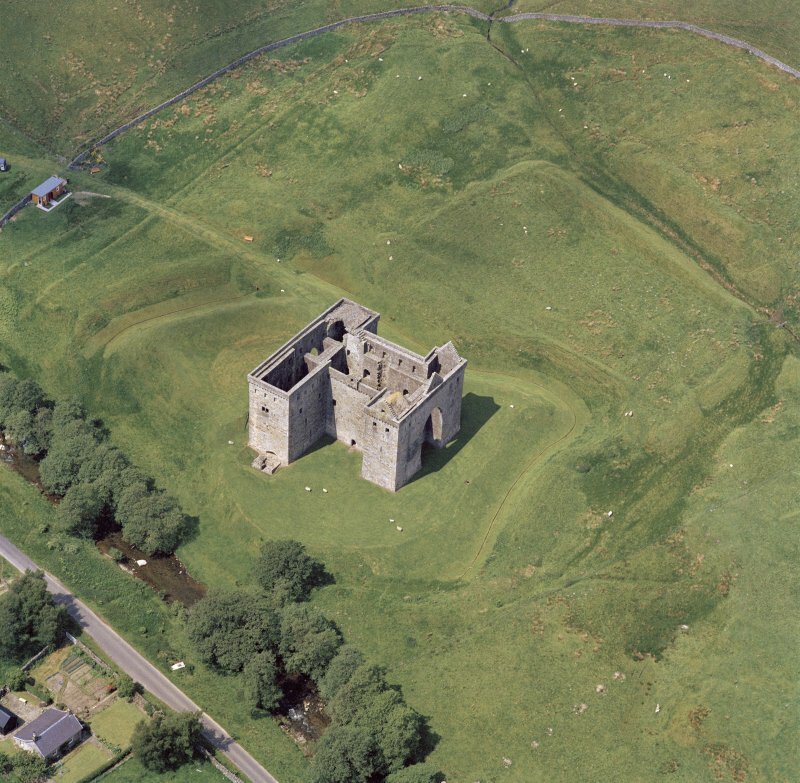 Oblique aerial view of Hermitage Castle centred on the remains of a castle, taken from the SW. 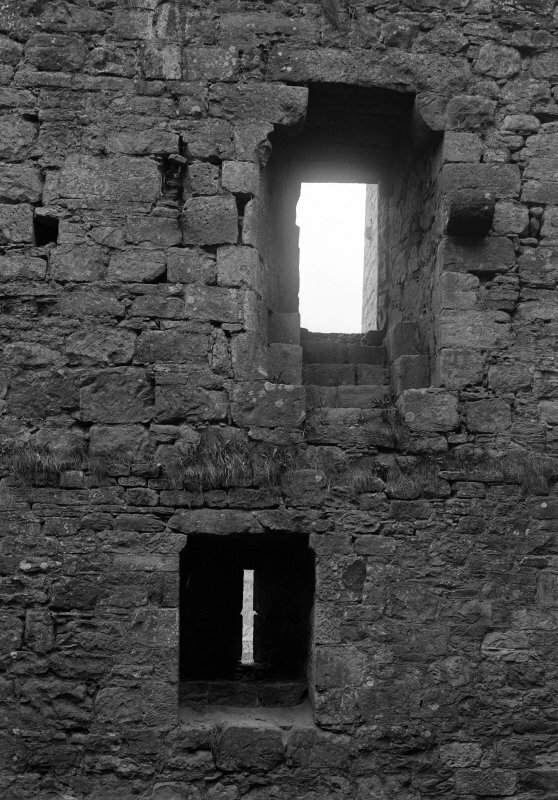 Interior view of windows, S wall. 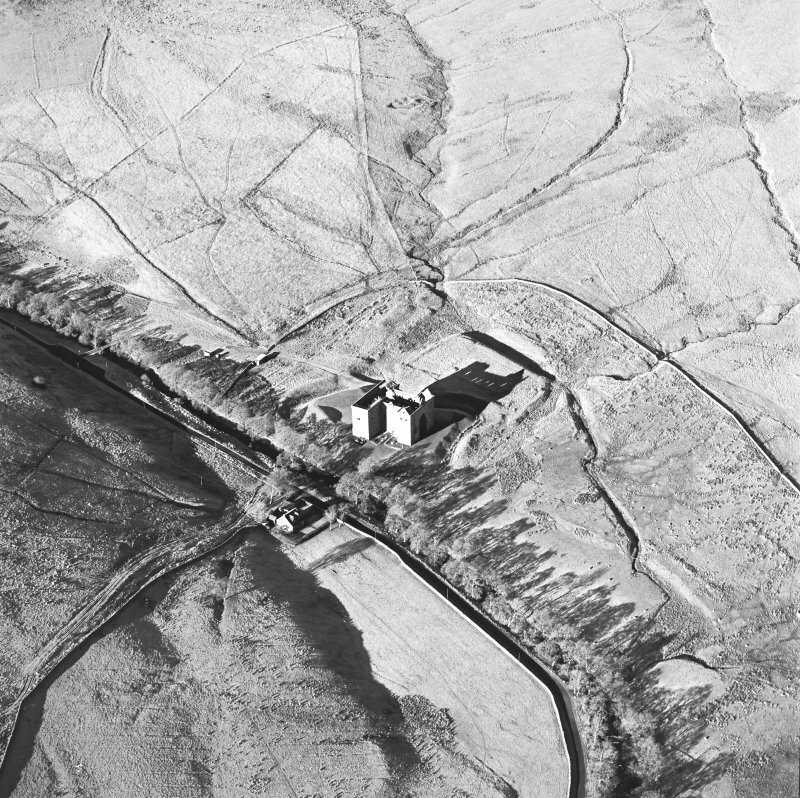 Oblique aerial view centred on the castle and moat and the farmstead to the E, taken from the SE. 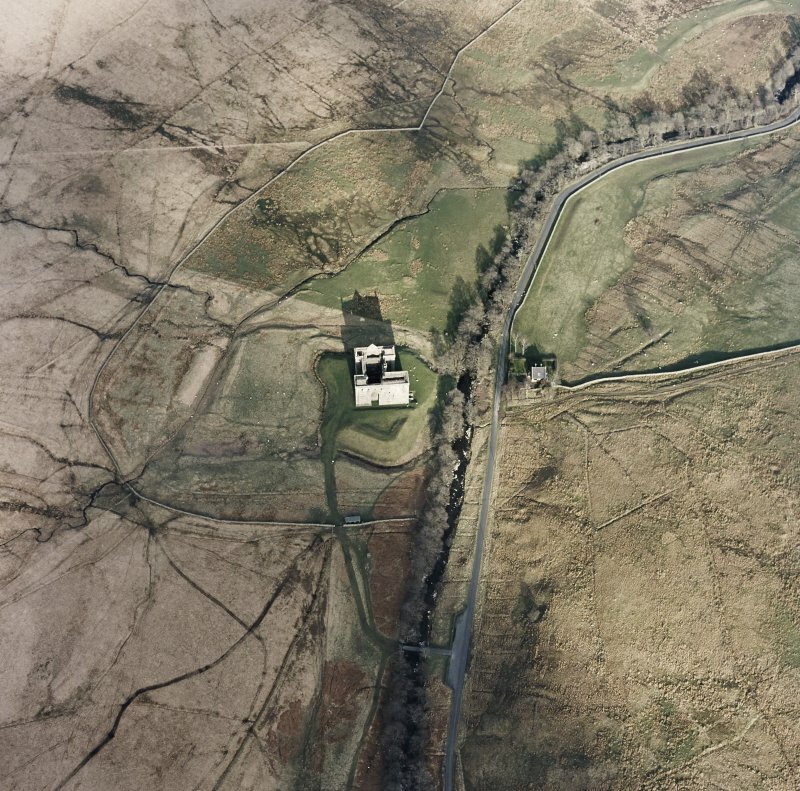 Oblique aerial view of Hermitage Castle centred on the remains of a castle and earthwork castle, taken from the N.
Oblique aerial view of Hermitage Castle centred on the remains of a castle with a chapel, boundary dyke and moated site adjacent, taken from the ENE. 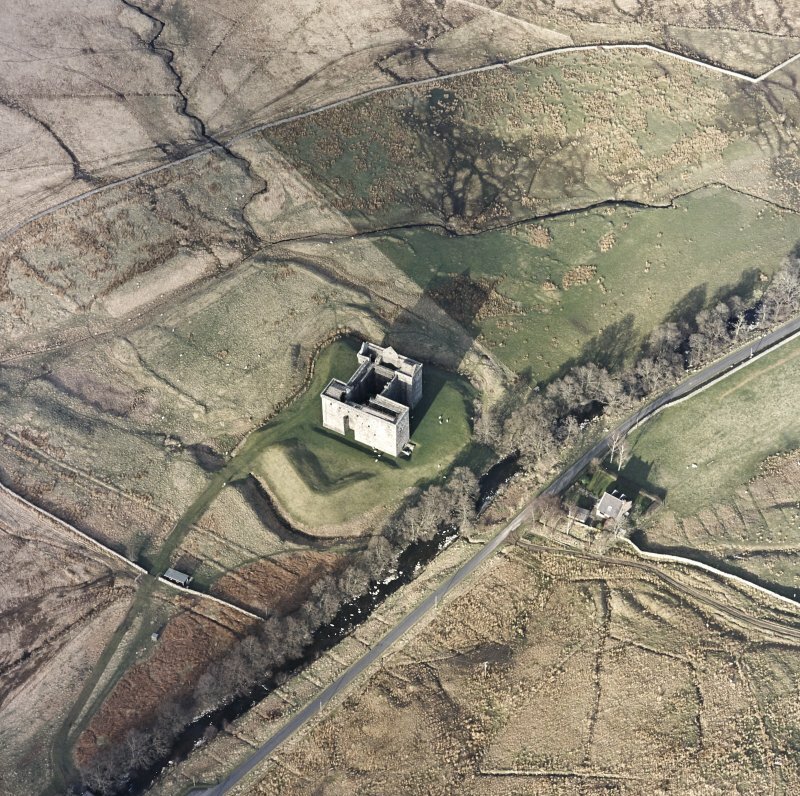 Oblique aerial view of Hermitage Castle centred on the remains of a castle, taken from the NW. 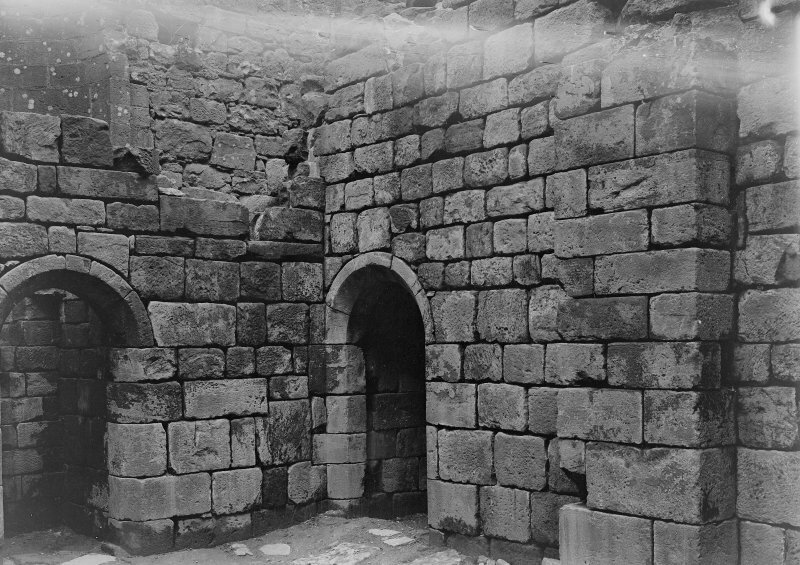 Interior of SE tower over postern. 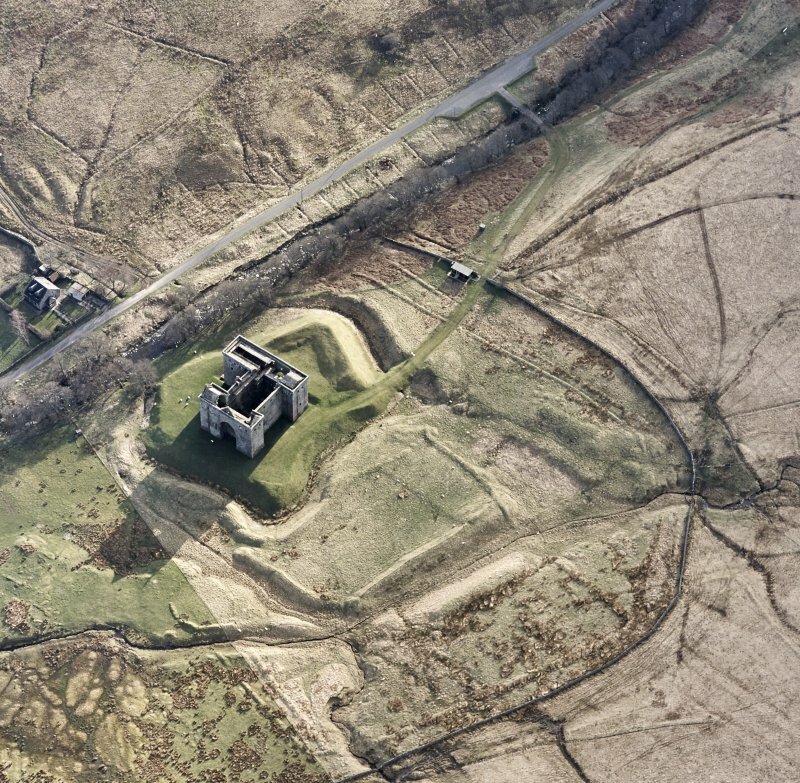 Oblique aerial view of Hermitage Castle centred on the remains of a castle and earthwork castle, taken from the SSW. 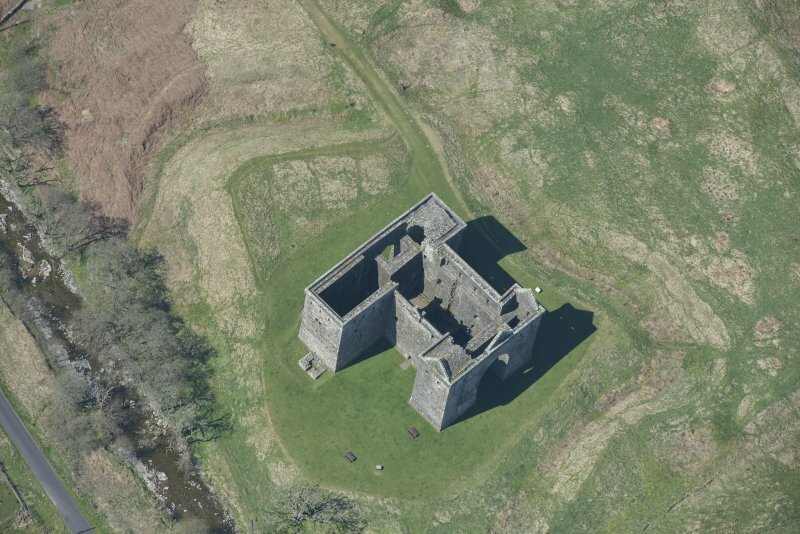 Oblique aerial view of Hermitage Castle centred on the remains of a castle with a chapel, boundary dyke and moated site adjacent, taken from the SW.
General view of stair in courtyard. 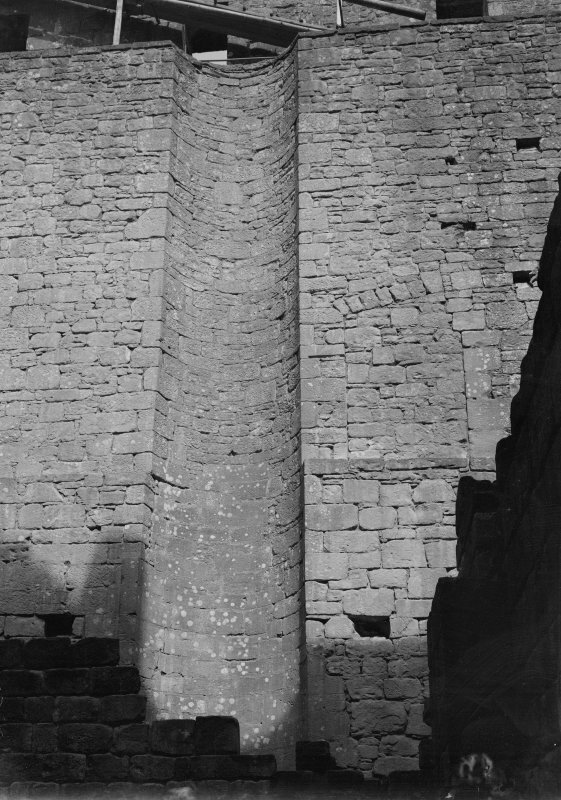 Exterior of SW tower, kitchen tower. 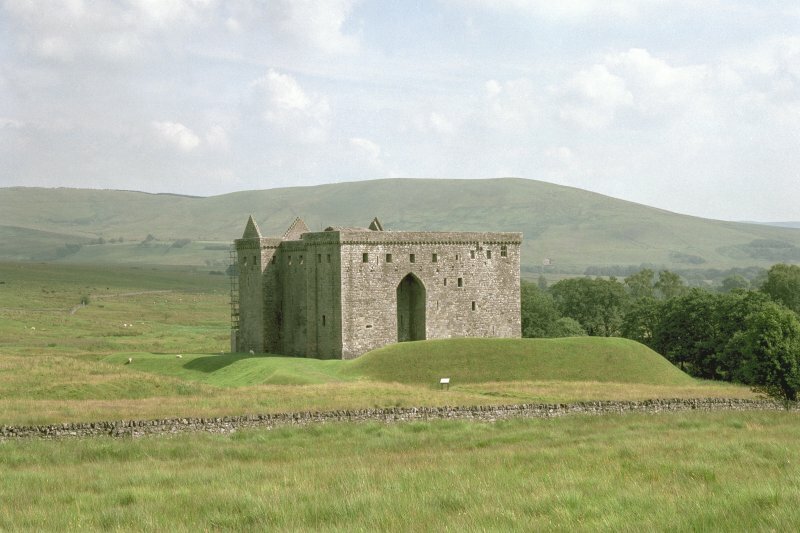 Hermitage Castle. 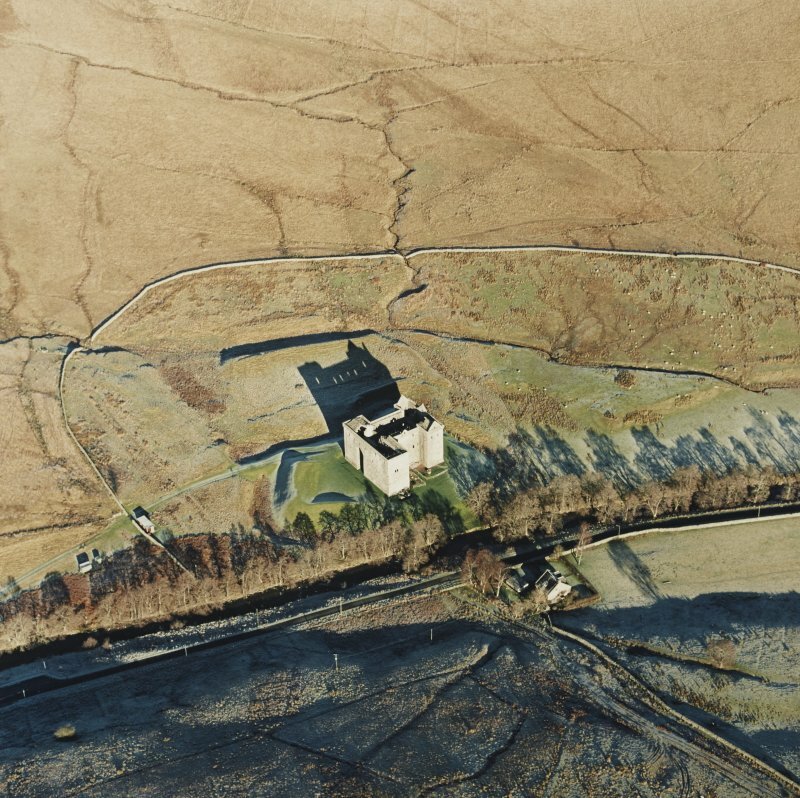 Hermitage, most perfect of the mediaeval castles on the Scottish Border, stands on the left bank of Hermitage Water in a remote moorland valley five miles N of Newcastleton and about the same distance NW of the Border on Larriston Fells. 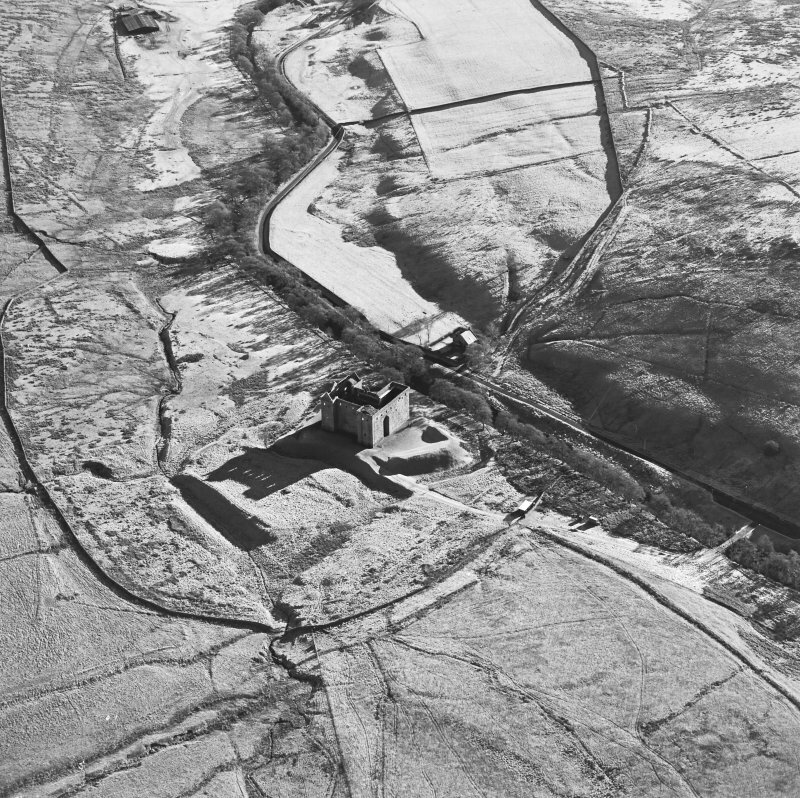 Apart from the river to the S, the situation afforded no other protection than that provided by broken and marshy ground; but except in the driest weather such ground was a formidable obstacle, and was so regarded in the mid-16th century by the compiler of a military report. 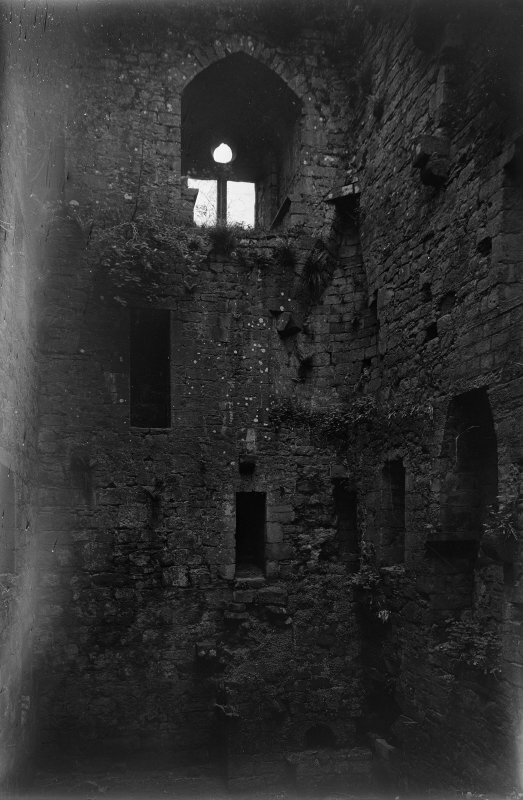 He describes the castle as "a oulde house not stronng, but ewill to be wyn by reasone of the strate grounde about the same" (R B Armstrong 1883). Even so, the site has been strengthened by an extensive system of outworks. 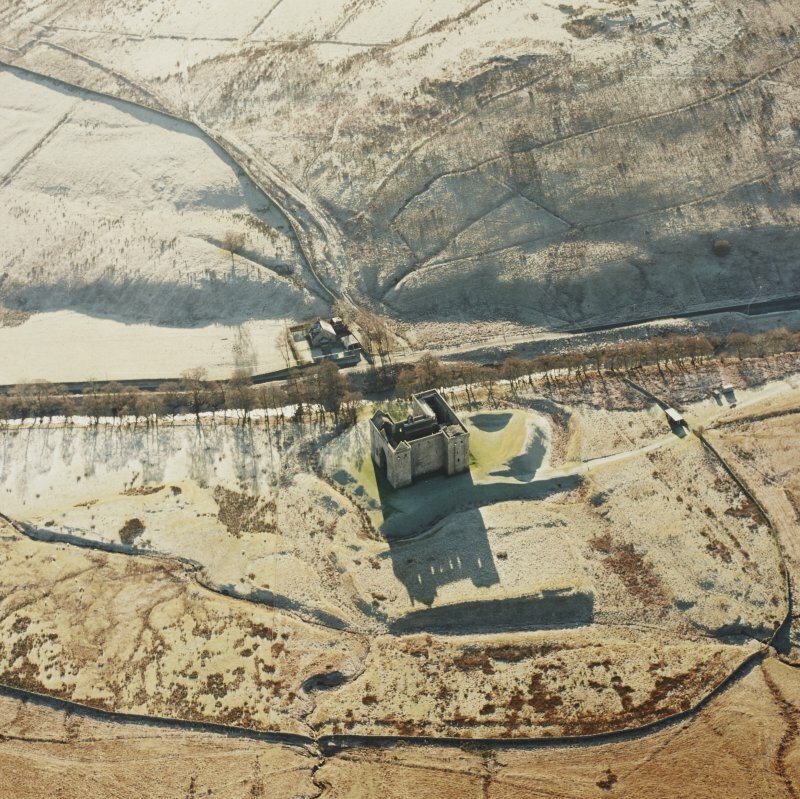 Outworks: These external defences are shown on the RCAHMS plan. The site has been sufficiently protected on the S by the river. 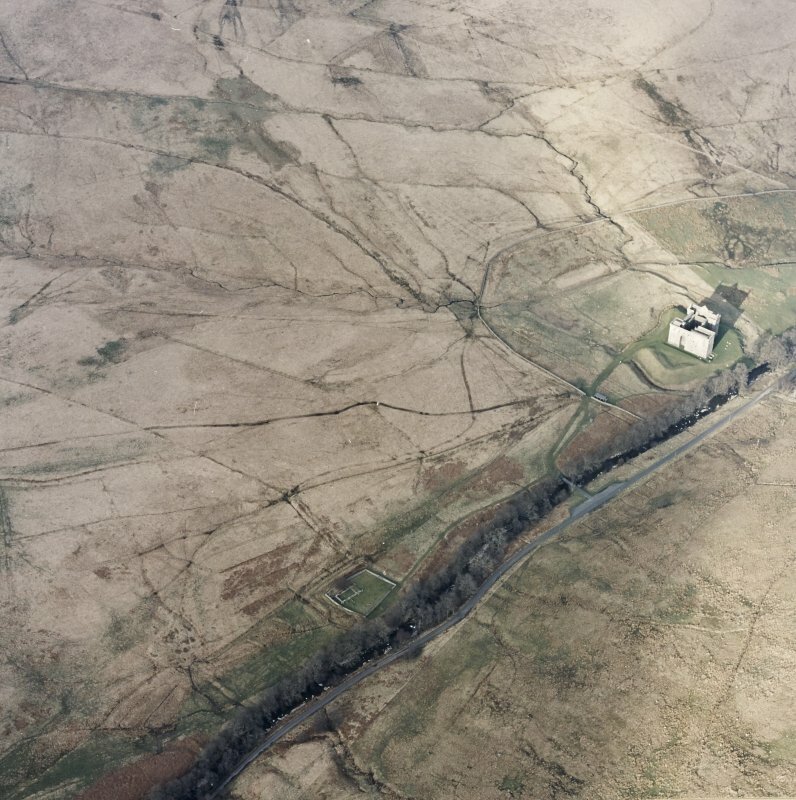 Its flanks have been defined by the courses of two small tributaries, the Castle Sike and the Lady's Sike, parts of which have been included in a ditch, measuring about 50 ft. in breadth and 12 ft. 6 in. 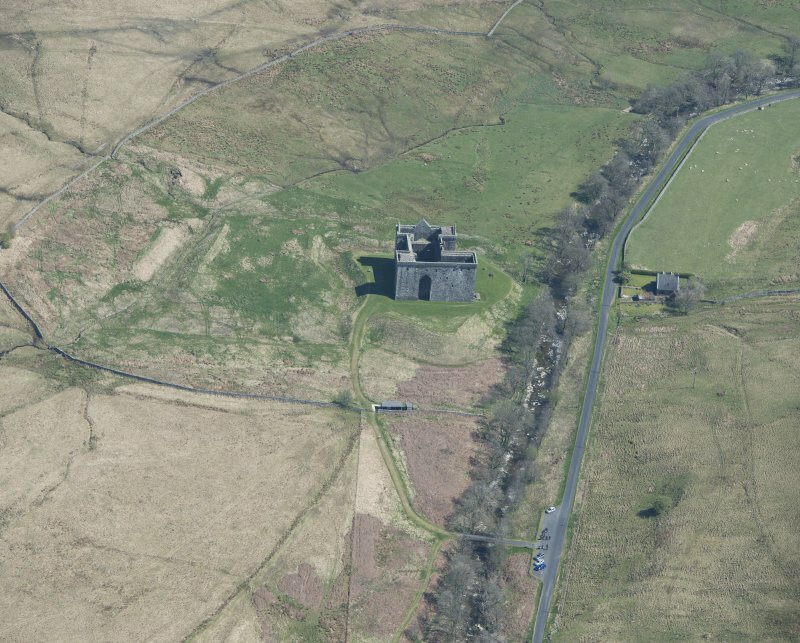 in depth, which runs roughly parallel to the three landward sides of the building. 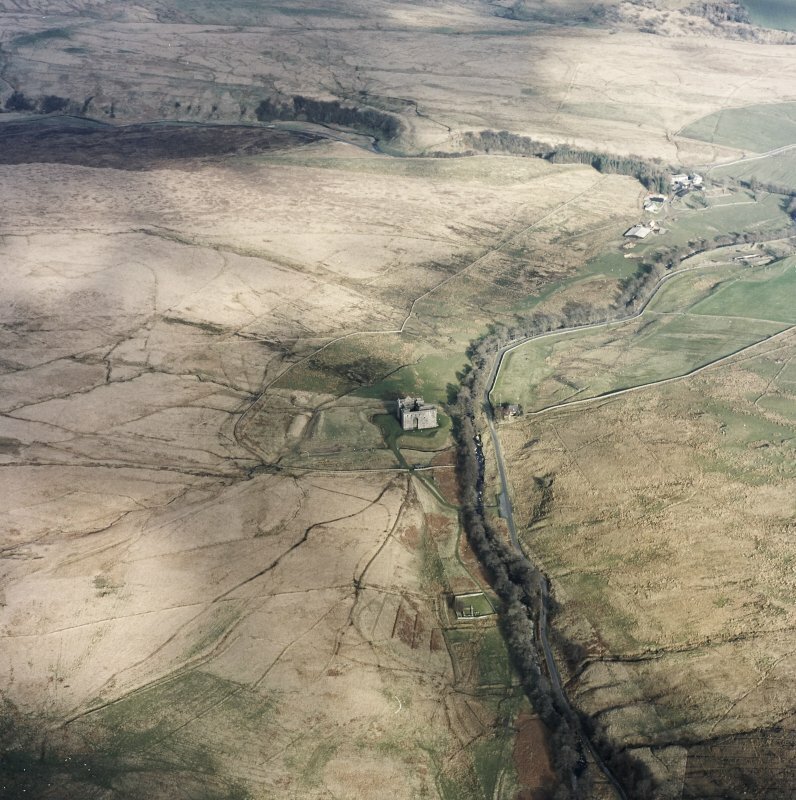 Ditch and streams enclose a level area, measuring 210 ft. from N to S by 200 ft. from E to W, which is separated from the river by a narrow strip of low haughland. 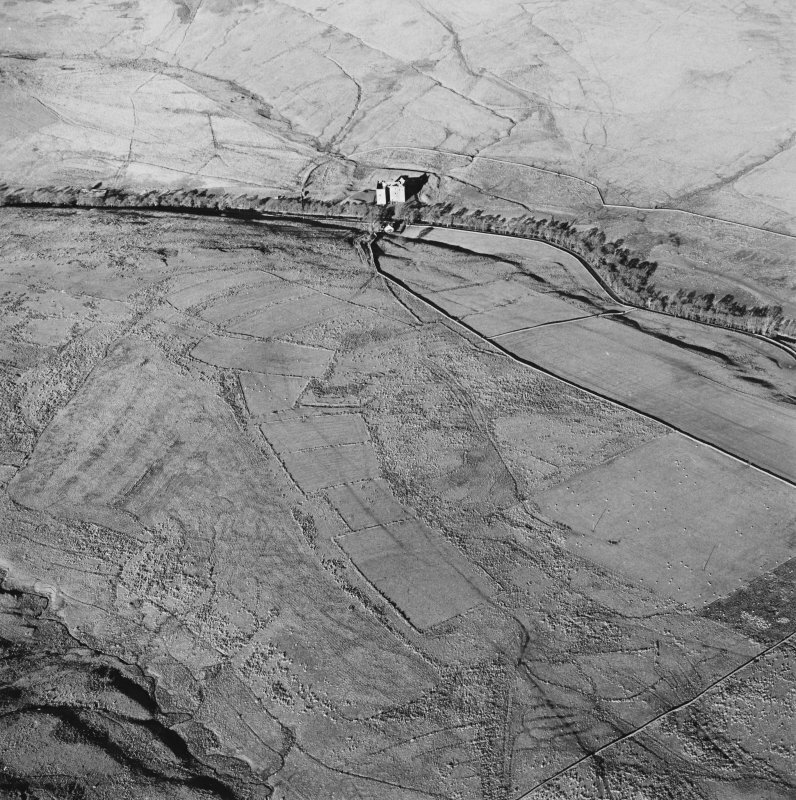 On the N of the ditch there is an oblong base-court, measuring about 140 ft. from N to S by 260 ft. from E to W and enclosed by a stout rampart. 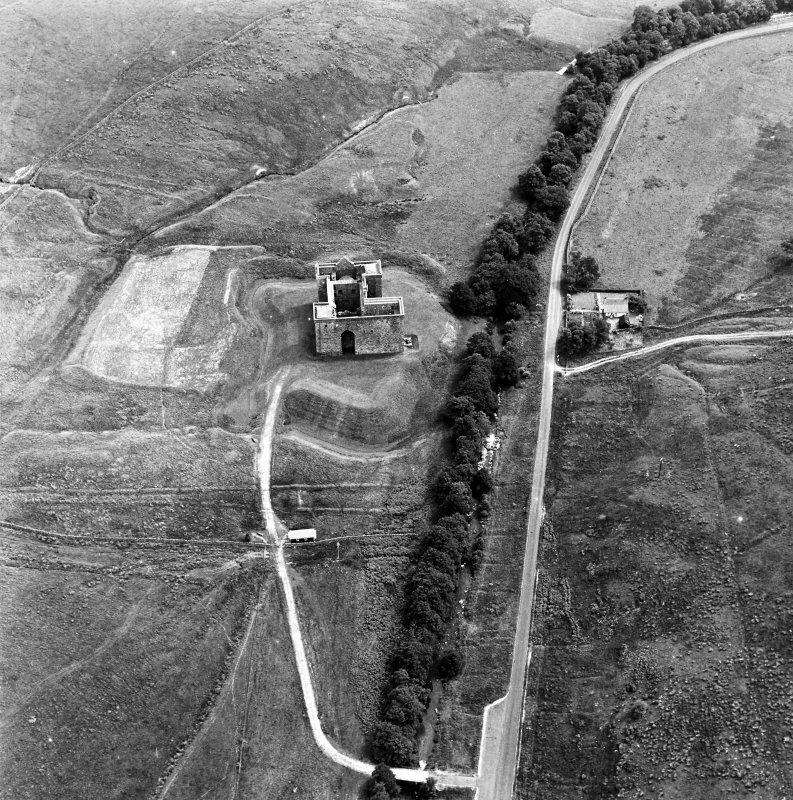 The base-court is protected on its flanks by the two "sikes" and in front by a ditch about 60 ft. broad and 15 ft. deep. This ditch, now traversed by the Lady's Sike, which has lately been diverted, bears a rampart on its counterscarp. The base-court appears to have been entered through the SE corner, but the opening, which was about 10 ft. wide, has been closed by a wall built across it. 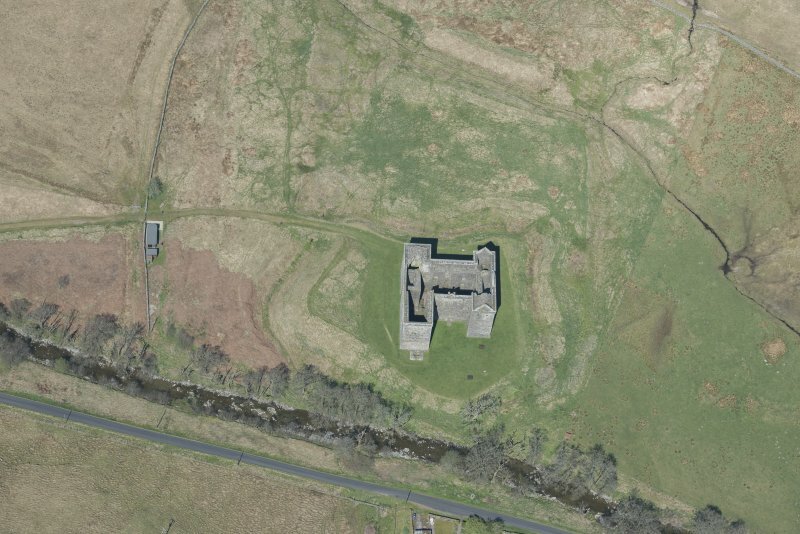 Lastly, there is a large mound of earth crowning the scarp of the main ditch on the W side of the castle. This is presumably a 16th-century gun-mount (cf. Historical Note infra). 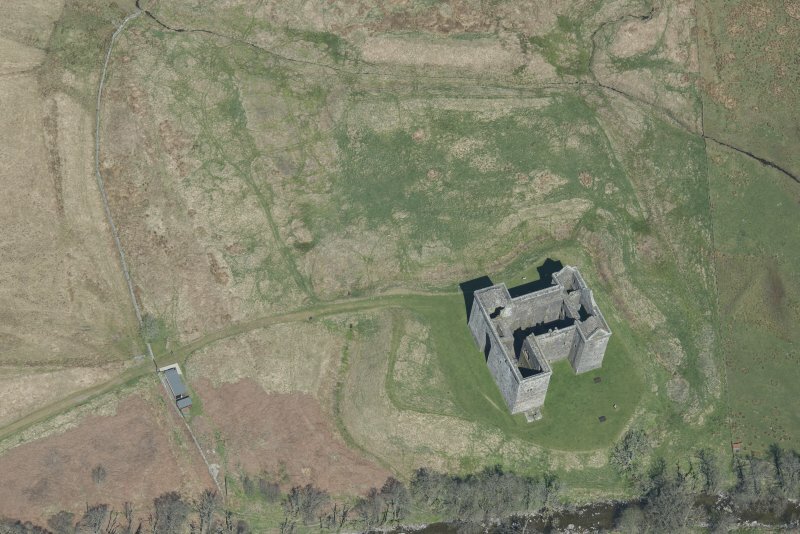 The Building: The present castle may stand squarely on the site of the castle that existed in 1296 (cf. 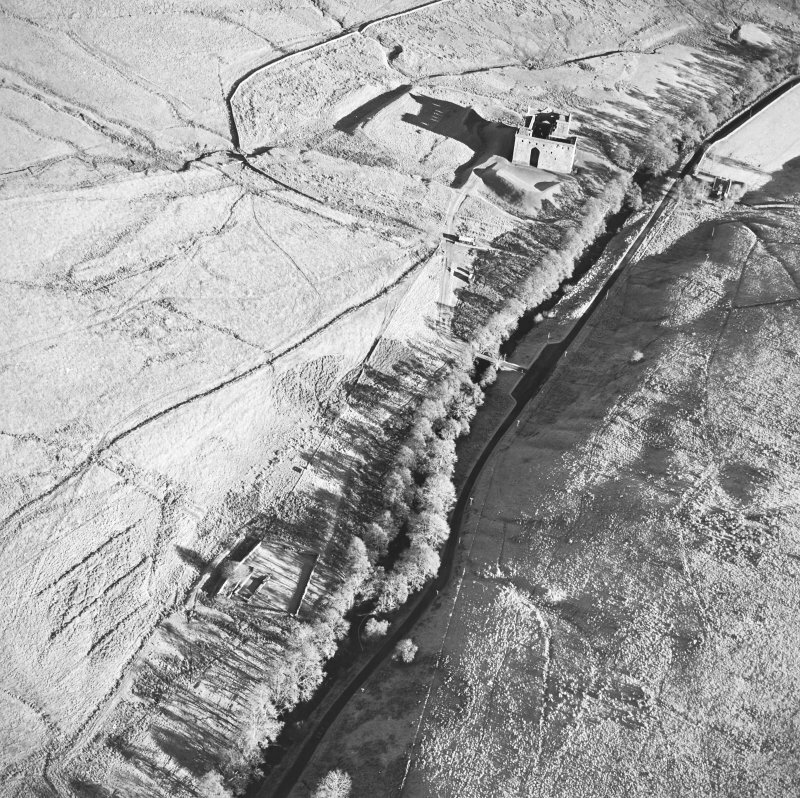 RCAHMS 1956 p.82), as there seem to be traces of early building towards the centres of the N and S walls, but the evidence is not conclusive enough to warrant the showing of this early period on the plans. Apart from this, an examination of the fabric discloses a sequence of four building-periods, and there is also evidence of the extensive restoration carried out in the early 19th century (Fig 116). 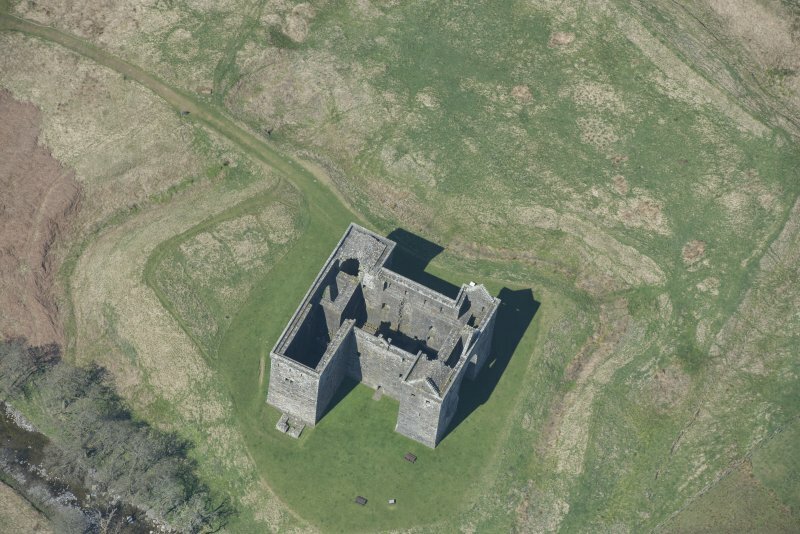 In its earliest phase the existing castle was oblong on plan and consisted of a small central court enclosed by cross-wings on the E and W and by screen-walls on the N and S sides; the S screen-wall contained the entrance, and the N one the turnpike stair. 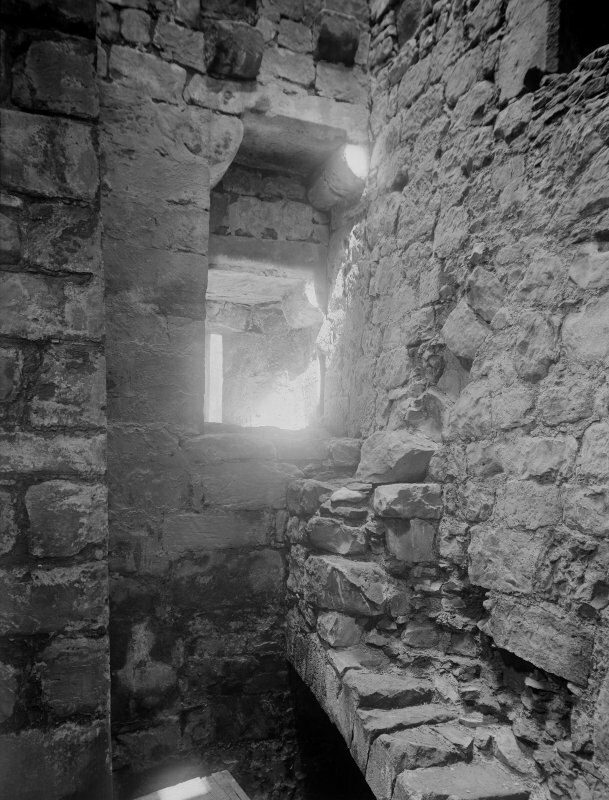 This stair never rose higher than the first floor of the wings, above which there may only have been one other storey. 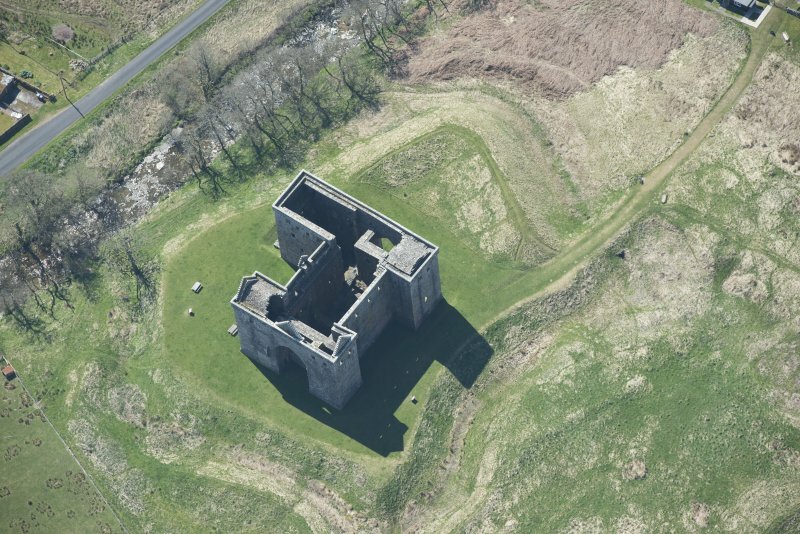 Such an arrangement is foreign to Scotland, but it does resemble that of some late 14th-century fortified manor-houses in the north of England, in which the constituents of the plan are a central hall flanked at each end by a cross-wing of three storeys. All that remains of this primary building at Hermitage is the lower part of the walls facing the courtyard, and whether the outer walls were entirely demolished, or were merely encased within the later walls now standing, is uncertain. 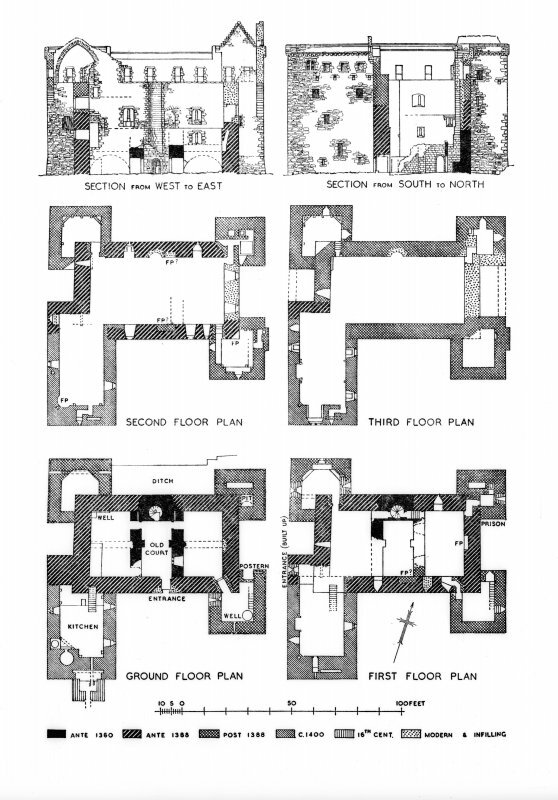 The surviving primary masonry, indicated in solid black on the plan (Fig. 123), is carefully built in squared ashlar, the courses being about 14 in. high (Fig. 122). Some stones bear mason's marks, one of which, several times repeated, is an R of 14th-century character. 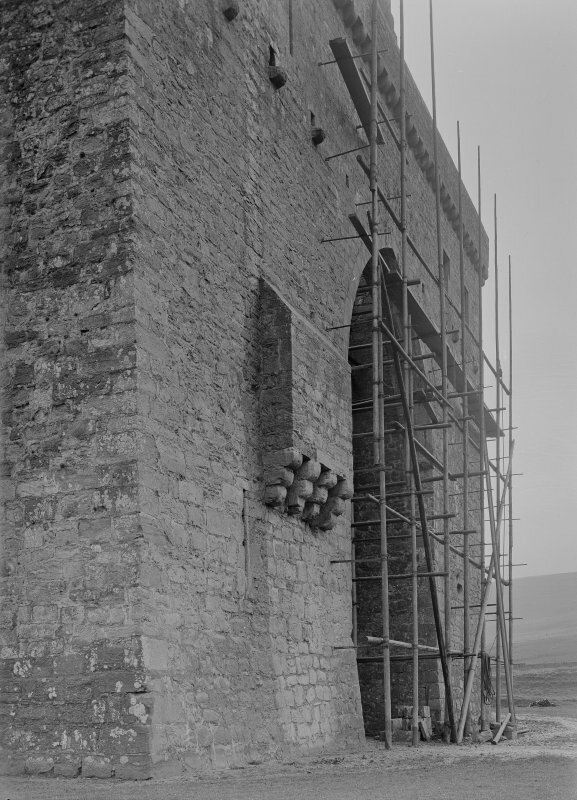 was oblong on plan but for a small square projection at the SW corner, designed to house, at first-floor level, an entrance which was protected by two sets of portcullis. 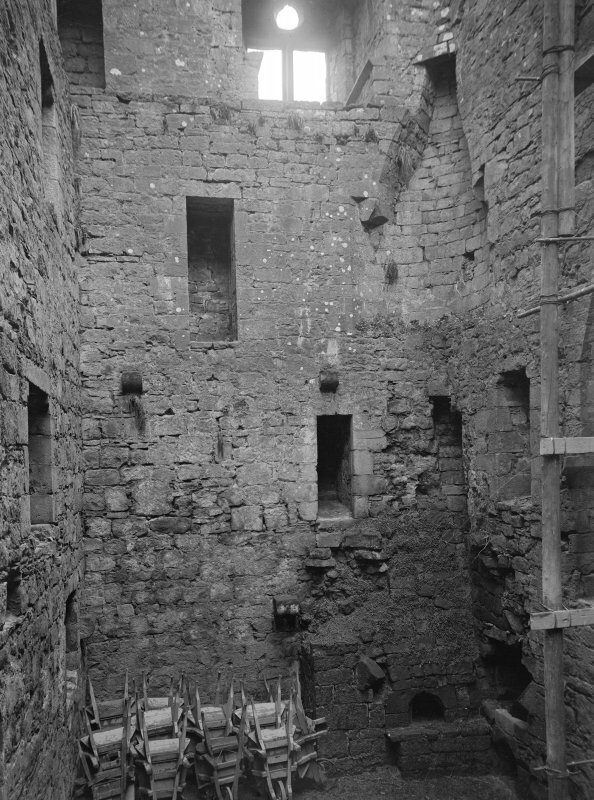 The open court of the first castle was now covered in, its surviving walls, reduced in height to suit new floor-levels, being utilised as internal partitions. 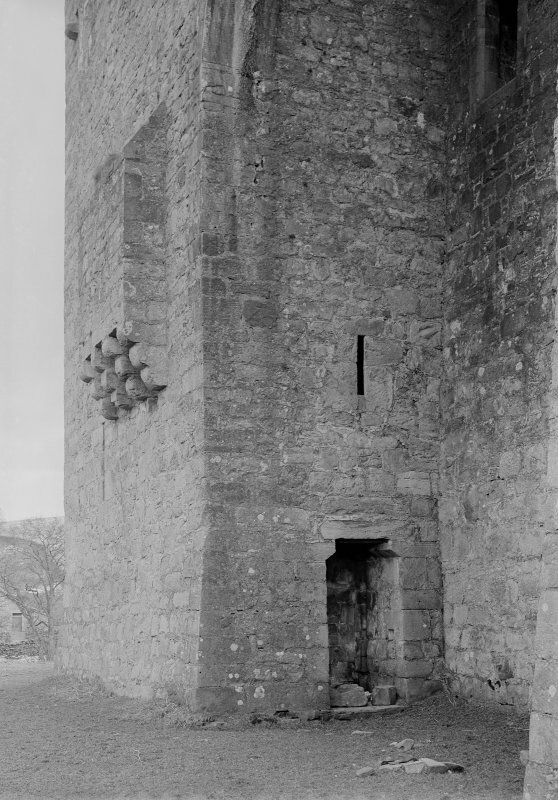 SE contained a postern on the lowest floor; and this entrance also was protected by a portcullis. In the fourth period an oblong wing, which incorporated the W entrance on the first floor, was thrown out from the SW corner. 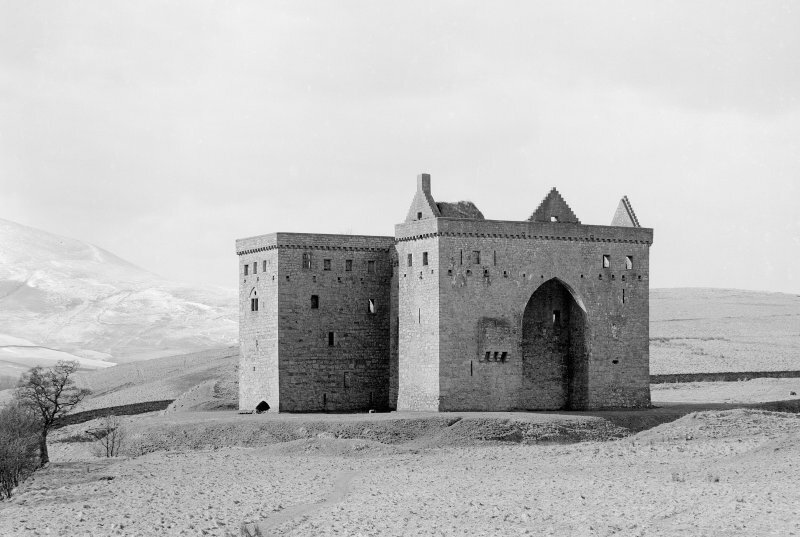 On the construction of this wing the superstructure of the whole building was completed with a continuous wooden hoarding projecting below the battlement. 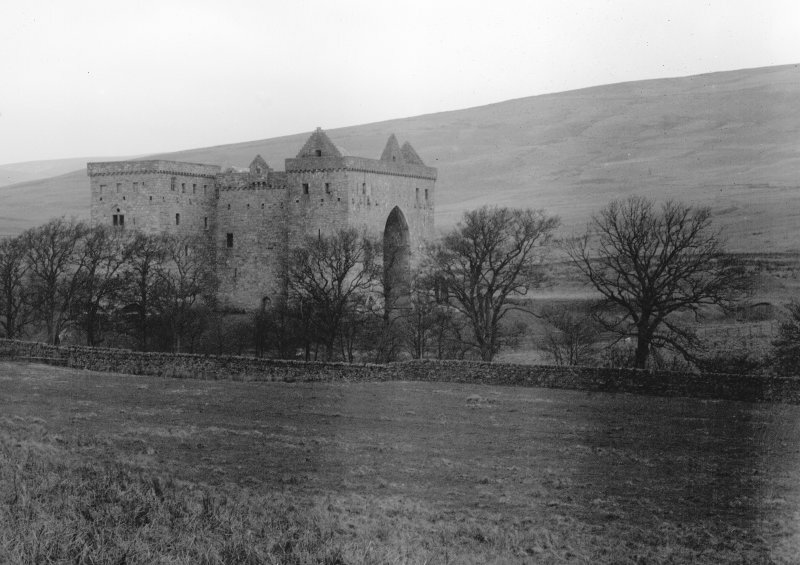 As it now stood, the castle had four main storeys. 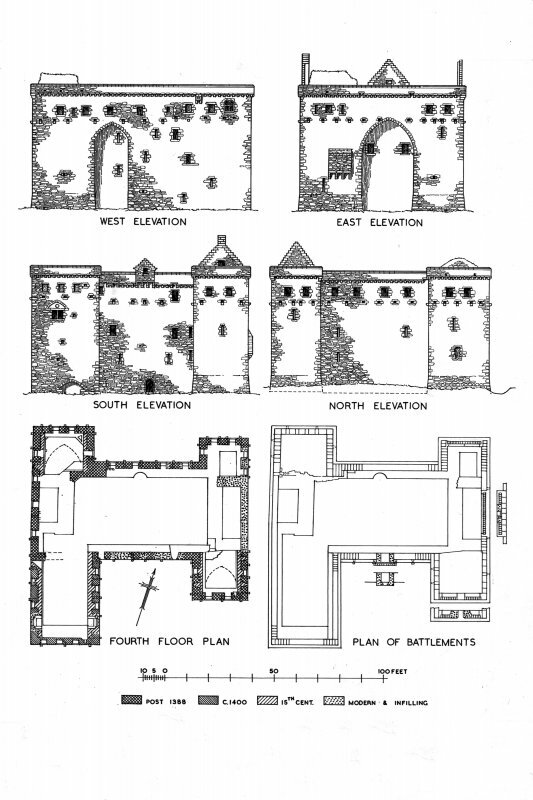 Such were the stages in the development of the castle, the work of the third and fourth periods extending and completing the unfinished castle that was begun in the second. The first period may be dated tentatively to about 1360, the second to before 1388, the third and fourth to the turn of the 14th and 15th centuries. Later additions and alterations were of minor importance. 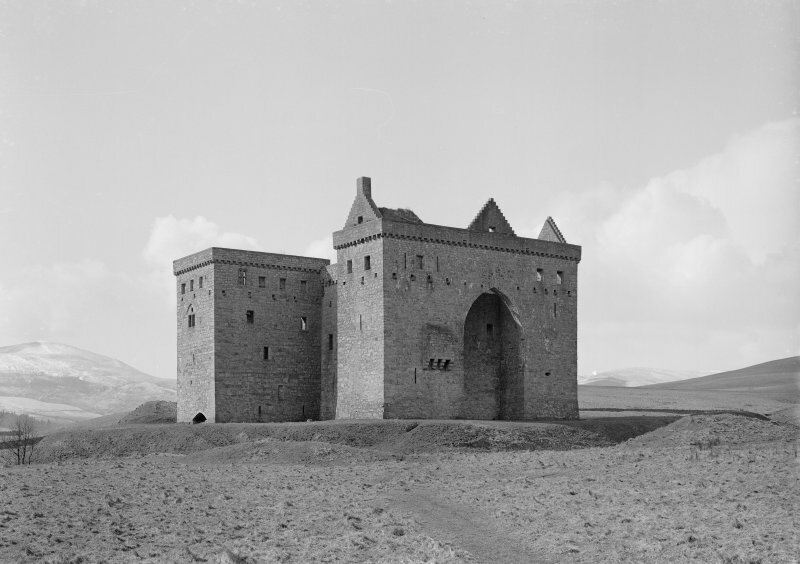 For example, the entrances on the E and W sides were both built up and thus there was left, as the only access, a doorway at ground-level on the S side which, although later than the entrance to the original castle, stands in the same position. 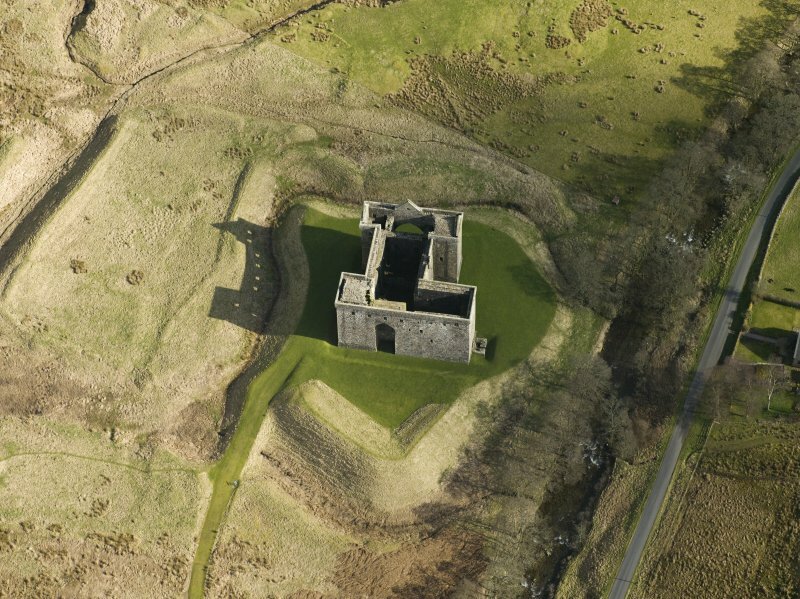 Then a low, outlying structure, evidently a cess-pit, was built against the S gable of the wing, where it received the contents of the drains discharging from that wall. 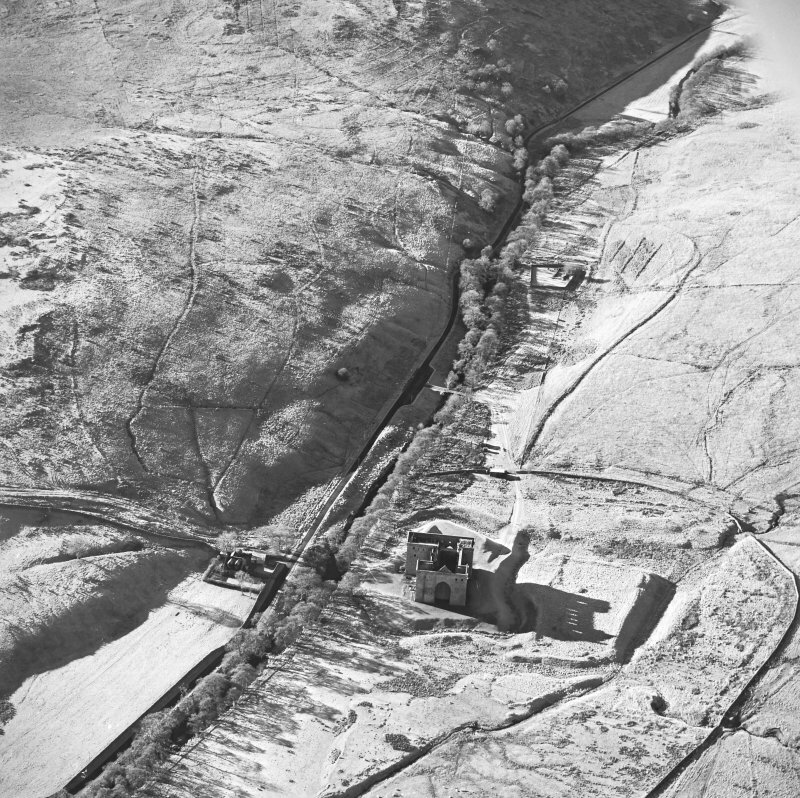 The latest defences to be added to the structure were a few oblong gun-loops of 16th- century type. 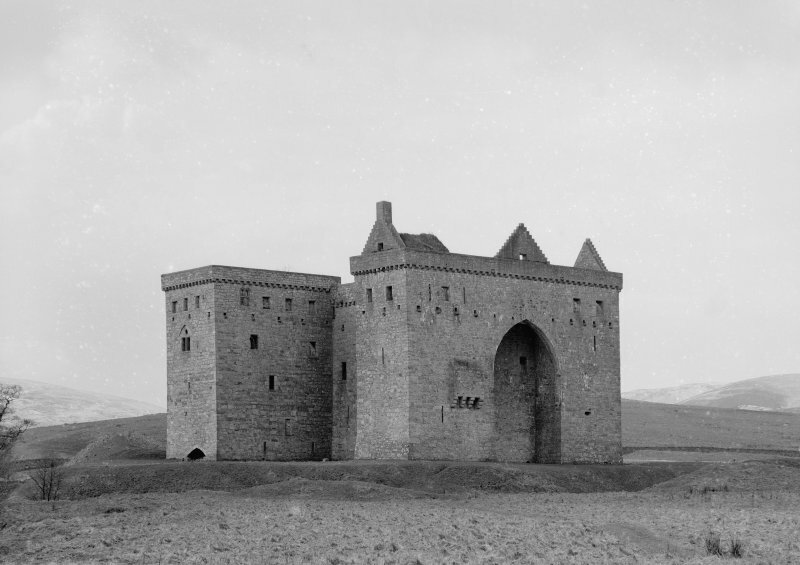 In the 19th-century restoration most of the superstructure was rebuilt, as well as the E side, the upper part of the SE tower and the arch that links that tower to its neighbour on the N.
was also renewed. The battlements, together with most of the corbelling and the wall-walk, have likewise been rebuilt. 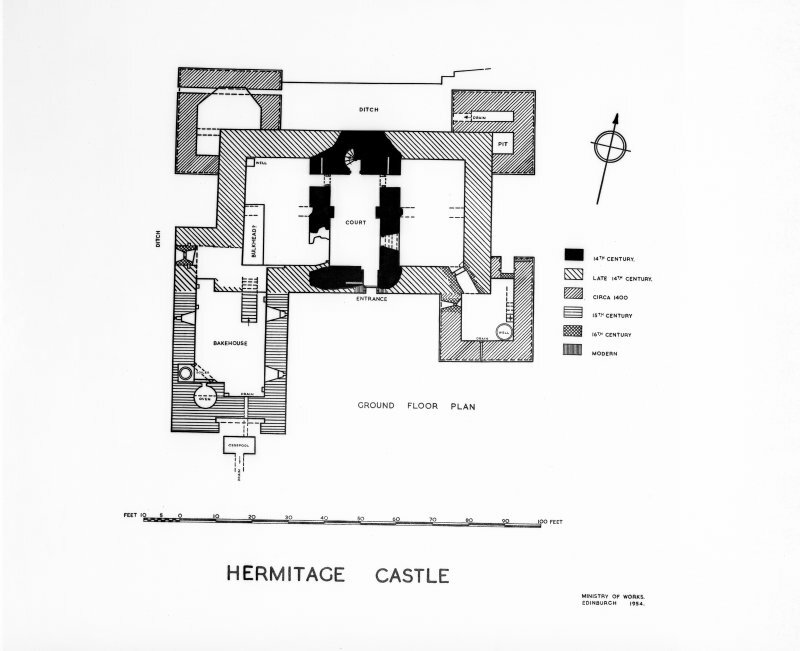 In I930 the castle was placed in the guardianship of HM Office of Works. 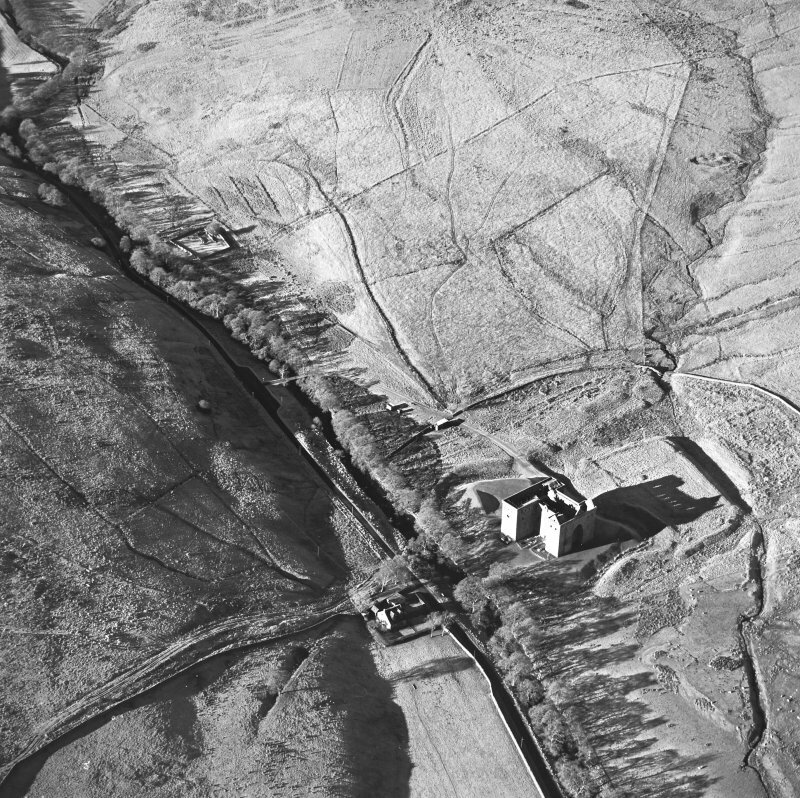 RCAHMS 1956, visited 1931 and 1945. 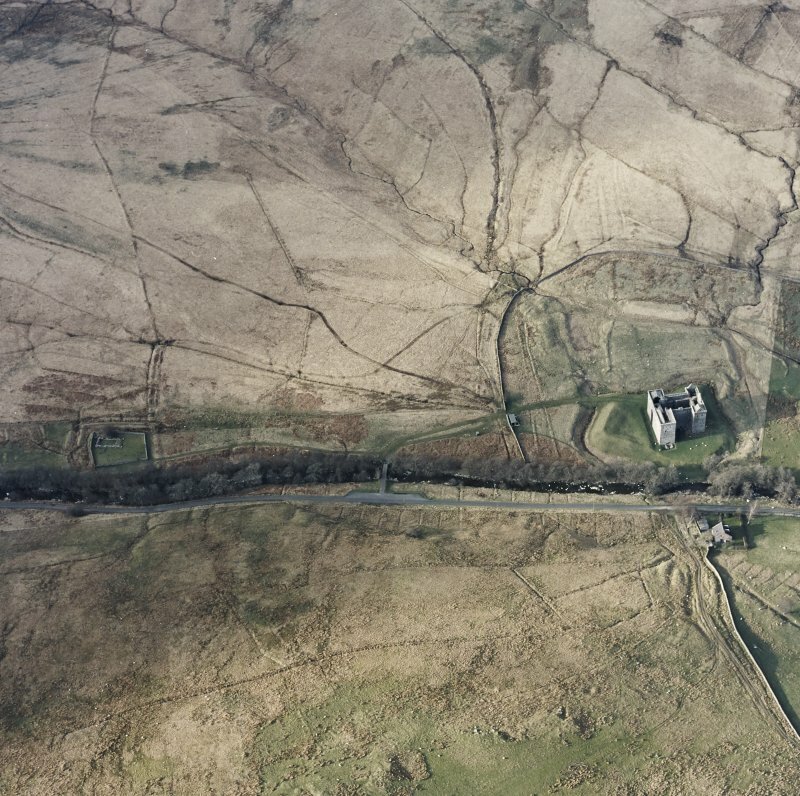 Hermitage Castle has two main phases, one comprising an earthwork, and the other the stone castle, but there are some plantation banks and stock enclosures overlying the outer earthworks. 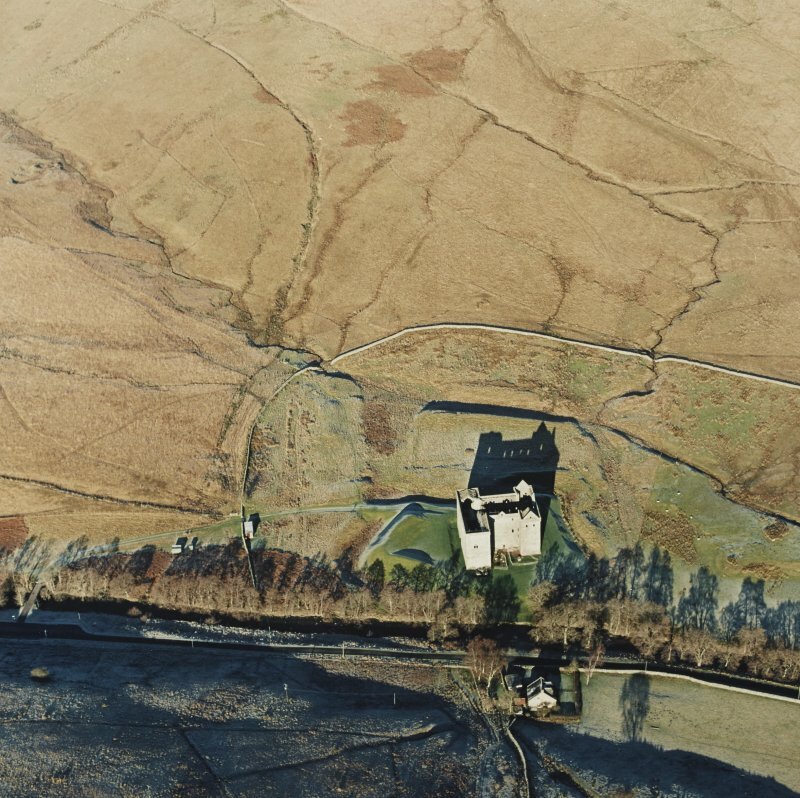 The stone castle was re-mapped but not recorded on this occasion. 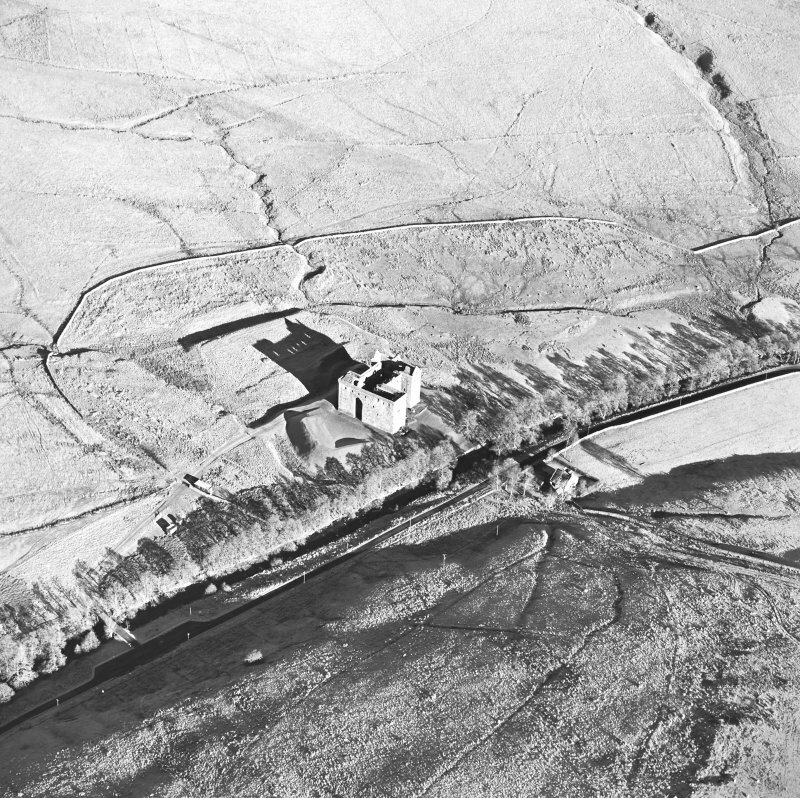 The earthwork castle is situated on the edge of the river-terrace on the N bank of the Hermitage Water, occupying the space between two natural water-courses that empty into the Hermitage Water. 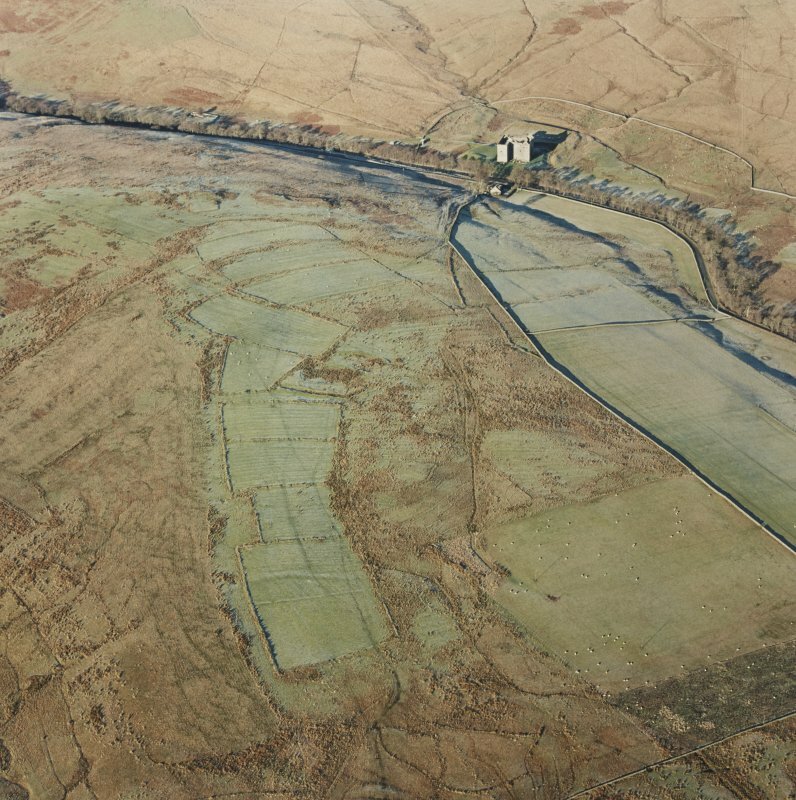 The earthwork comprises a large polygonal enclosure, measuring about 75m from E to W by about 45m within a massive ditch about 17.5m in breadth by 4.5m in depth. 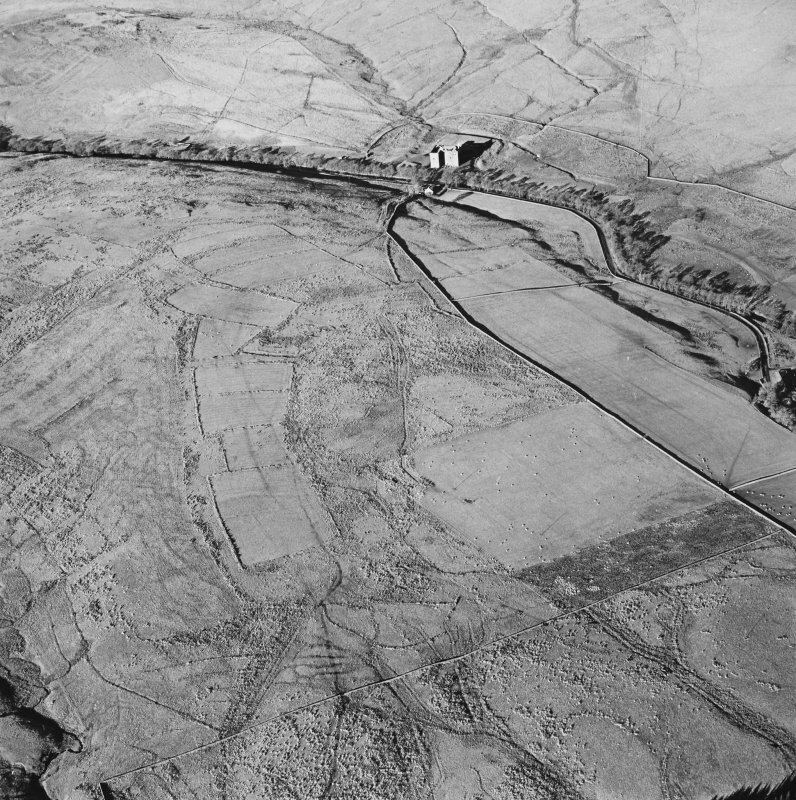 A substantial part of the area enclosed, however, must have been occupied by a rampart, which is still extant on the W and part of the S, and measures about 12m in thickness by about 3.5m in height. The ditch displays traces of having been revetted with stone in places, but this may belong to the stone phase. On the S the rampart has been levelled and the ditch filled to make a level court in front of the entrance to the stone castle. 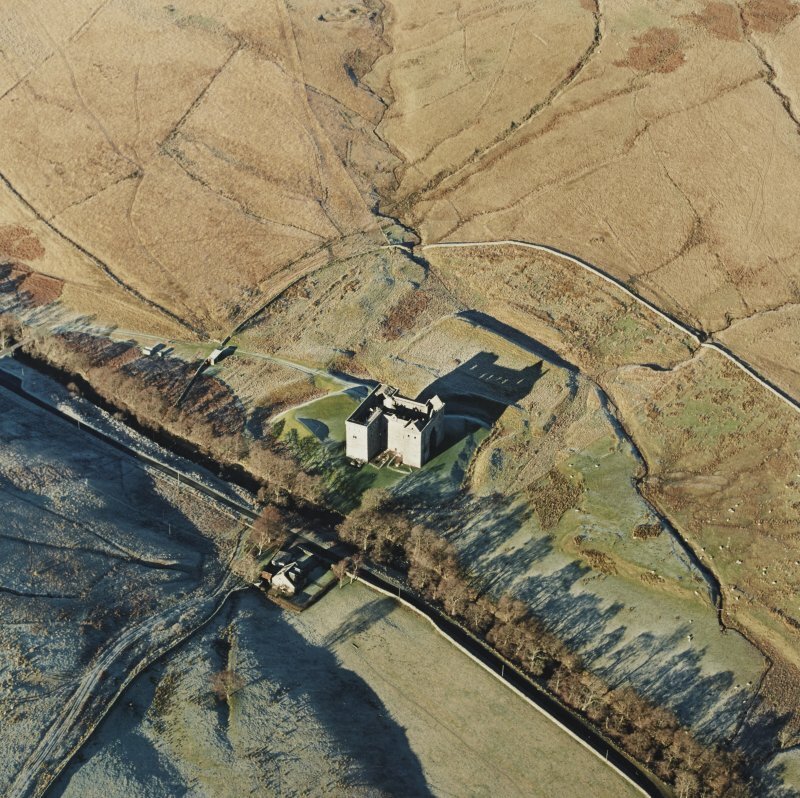 This modification to the earlier defences must be at least partly medieval in date, if only to provide the space needed for the construction of the stone castle, but some caution about the present form the earthworks is required. 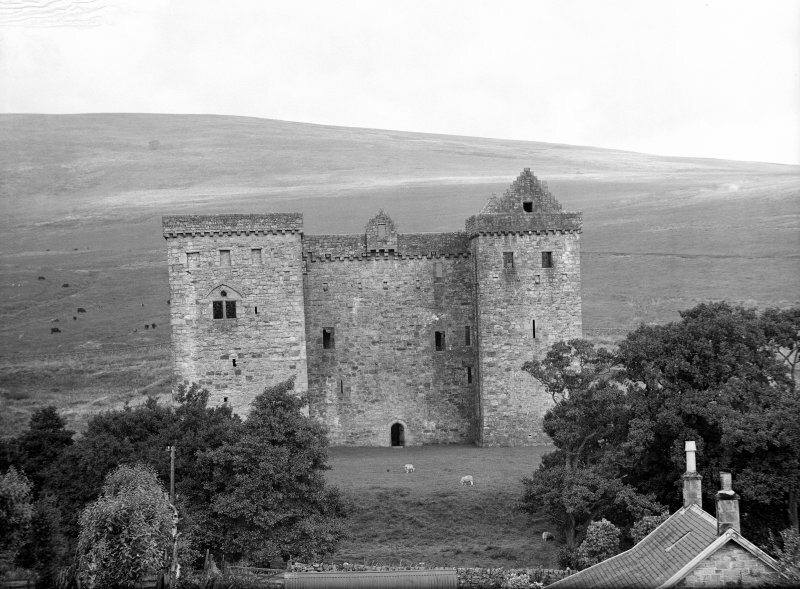 The castle was cleared of rubble and restored in the late 19th century and other alterations may have taken place at that time. 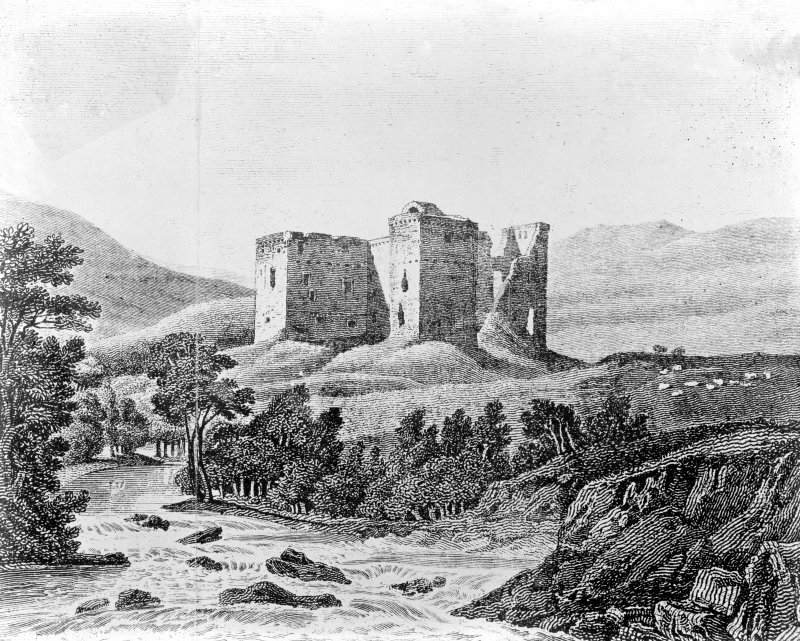 n engraving of 1815 shows the sides of the stone castle heaped up with overgrown debris (NMRS RXD/233/19). 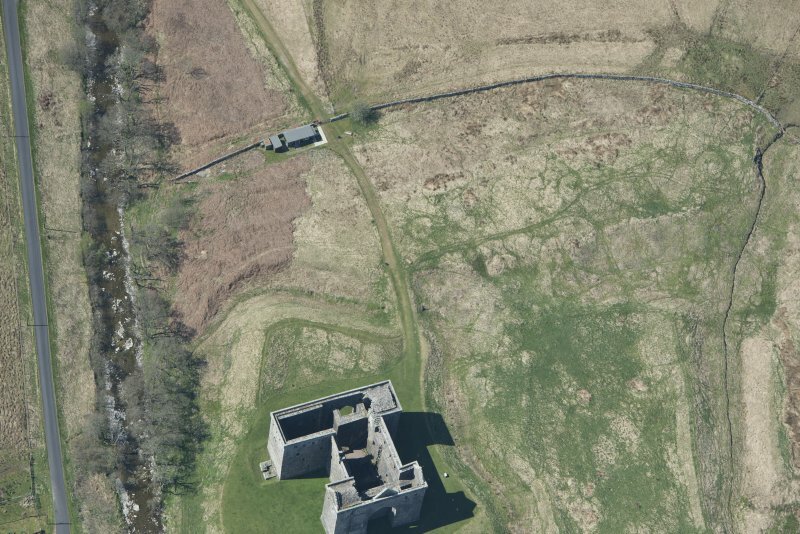 The only evidence for an original entrance is a stone plinth or abutment on the outer lip of the ditch at the NE corner (NY 4970 96090), but this could belong to the stone castle. 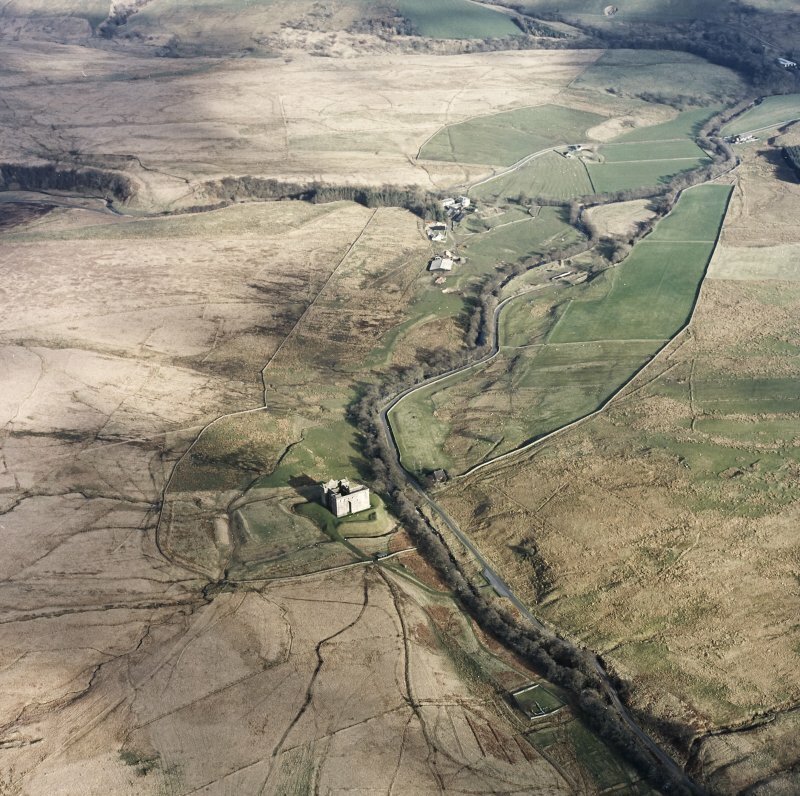 The present causeway across the W ditch, which is depicted on the 1st edition OS 6-inch map (Roxburghshire 1863, sheet xlii), is probably not original, but a causeway shown across the N ditch to the 'outer court' at the same corner has since been removed. 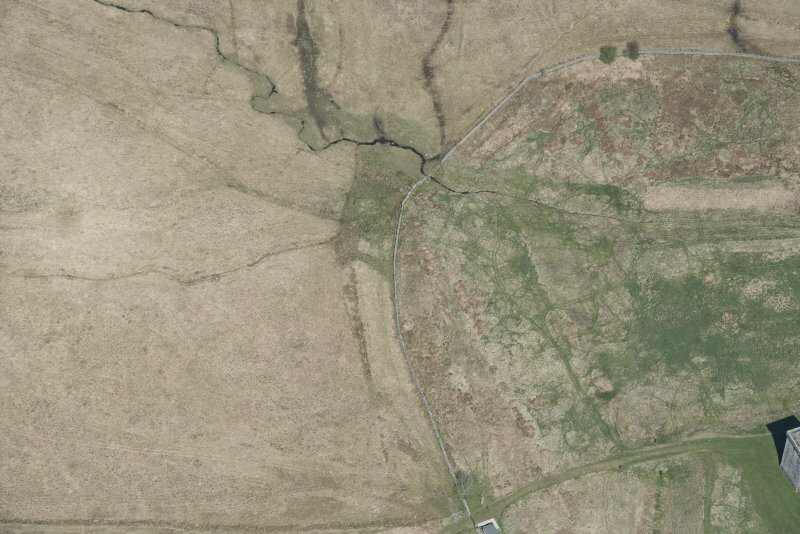 Probably coeval with the earthwork castle is the substantial outwork that runs between the two watercourses to the N of the Castle. 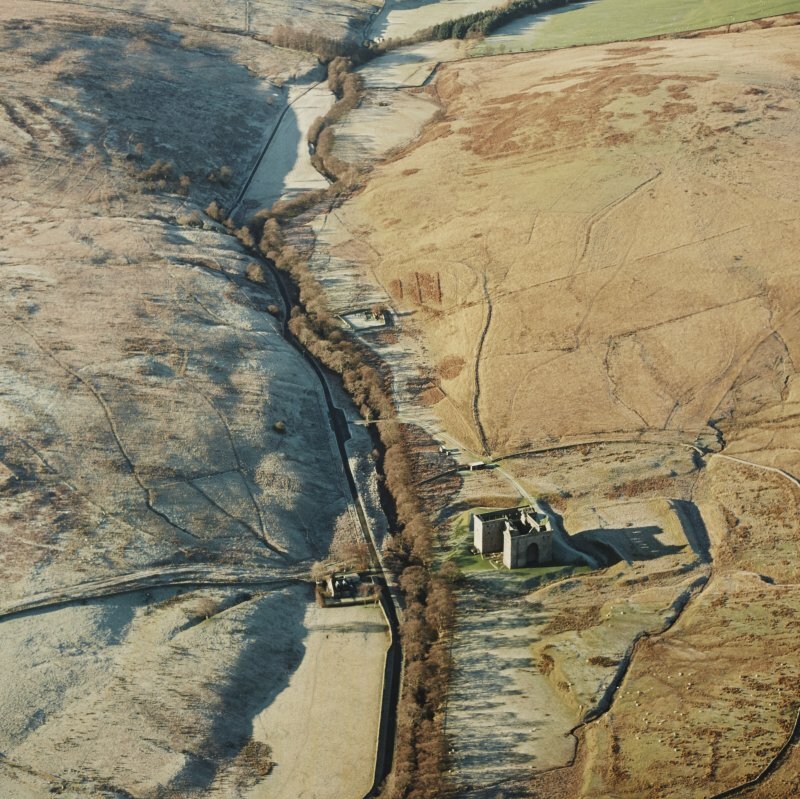 This outwork runs from W to E, diverting the flow of the westerly of the two burns to the E and from thence via a further manmade cutting 150m long, to ensure that the two burns empty into the river 120m E of the castle. 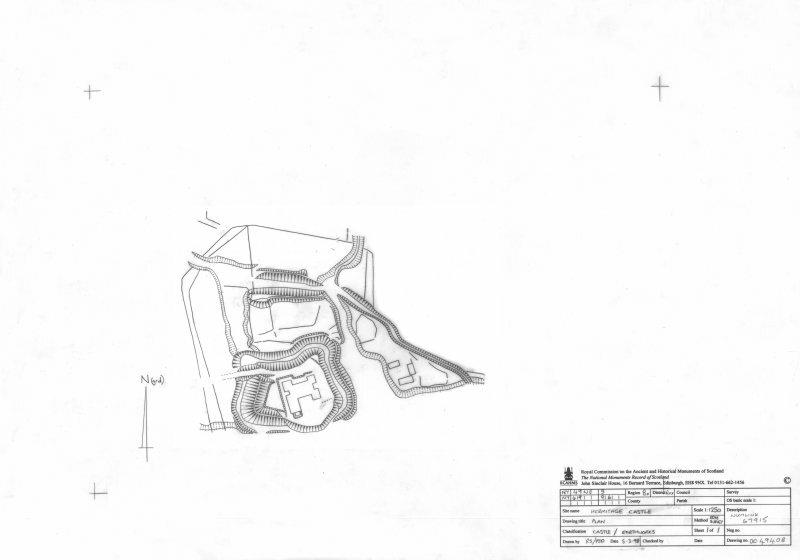 The main cutting is 20m wide with an upcast bank that matches that of the castle rampart in scale, but the bank is irregular in both plan and profile, broad at the W end and tapering towards the E. There is also some dumping of spoil on the N of the cutting. 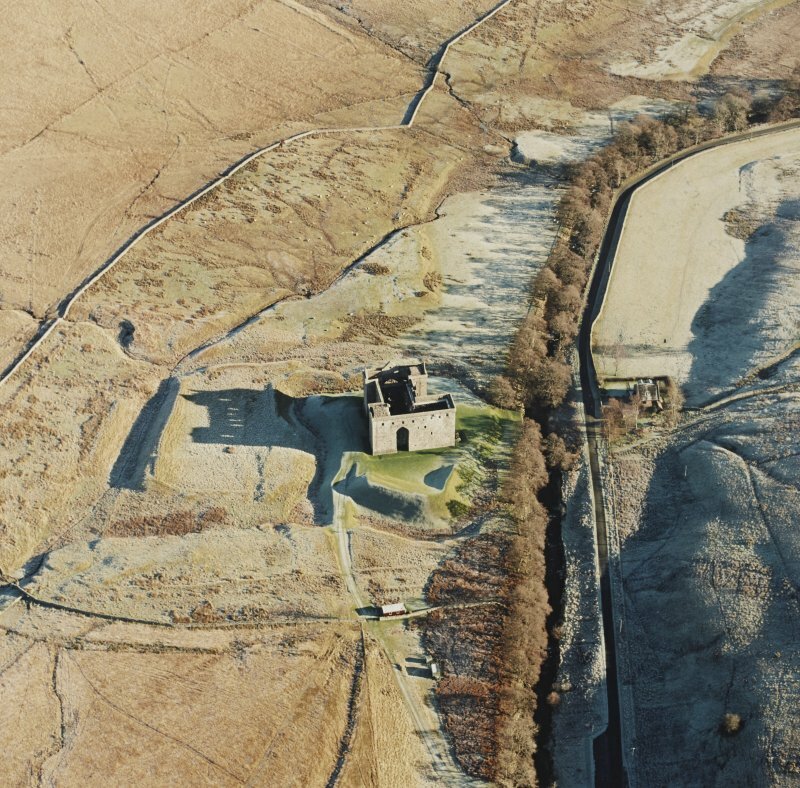 Confirmation of this interpretation as a water-management system is the lack of any enclosing ramparts down the sides of the so-called 'outer-court', as it is referred to in previous descriptions of the castle. 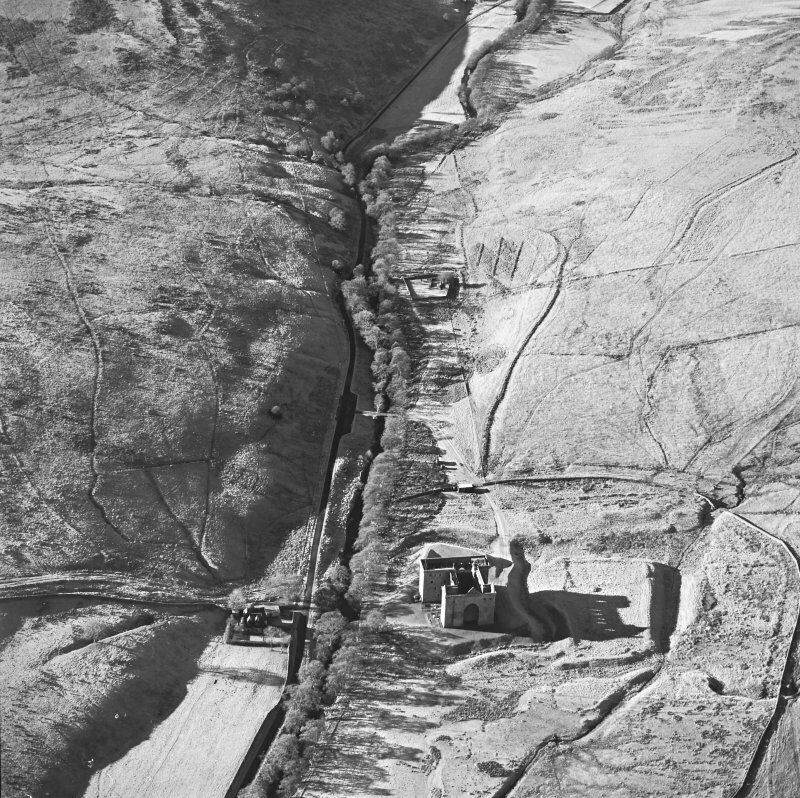 Apart form the upcast from the main cutting, all the other features in the vicinity are secondary banks that override the outwork or the castle earthworks. 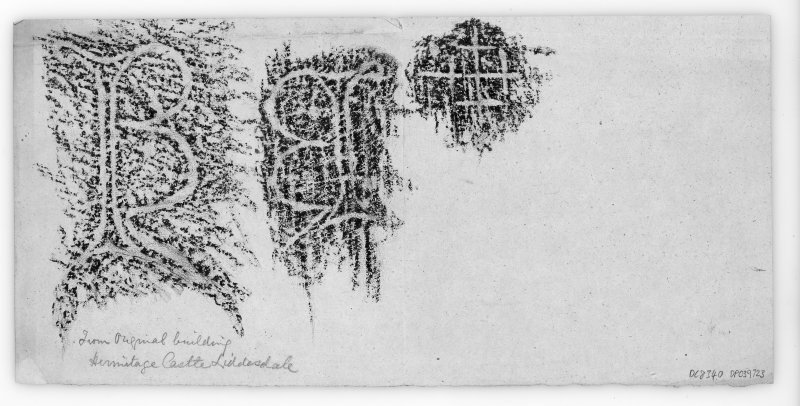 These comprise a system of banks enclosing narrow strips of ground on three sides of the castle, which has been interpreted as plantation banks, and a related system of banks that define two phases of enclosure in the space between the outwork and the castle. 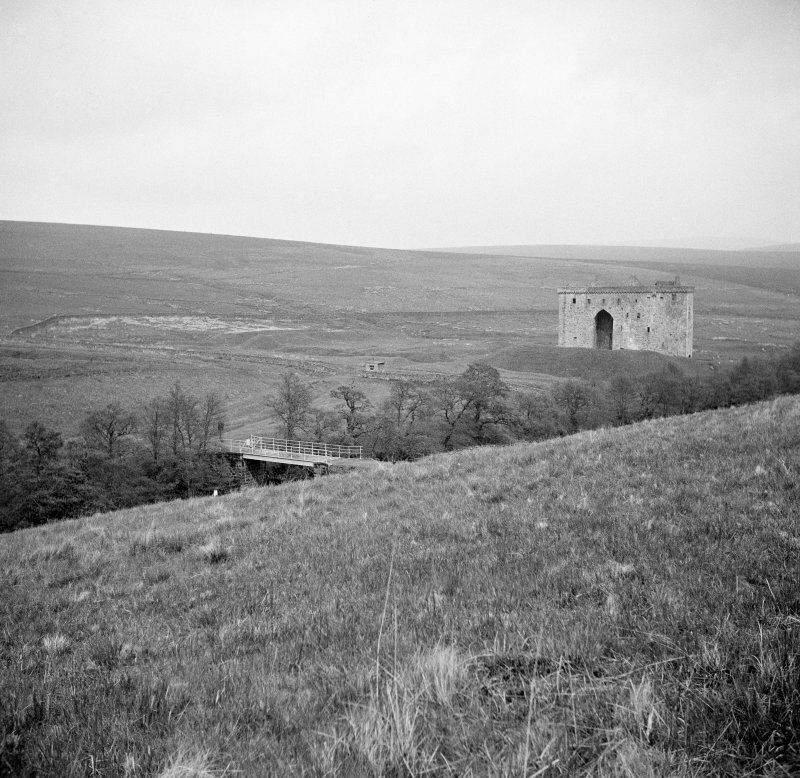 NY 496 960 The cutting of channels for drainage pipes over the track leading to Hermitage Castle was monitored. 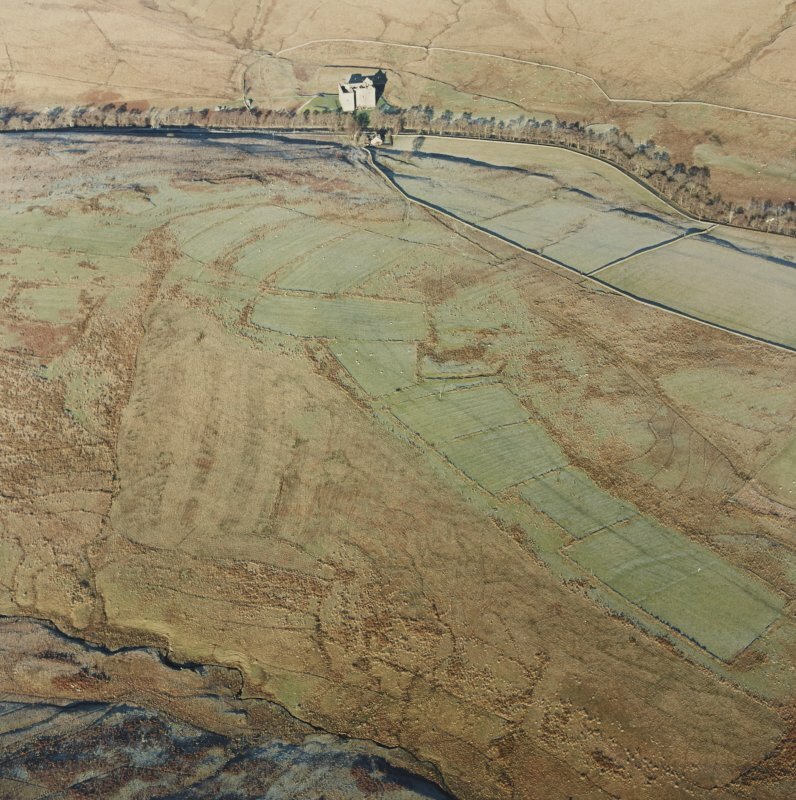 Although the area to be monitored was not within the immediate area of the surviving castle, the extensive earthworks around the castle, which makes use of a defensive earthworks c 400m to the W, and a possible settlement beyond this, all indicate that the general area is of great archaeological interest. 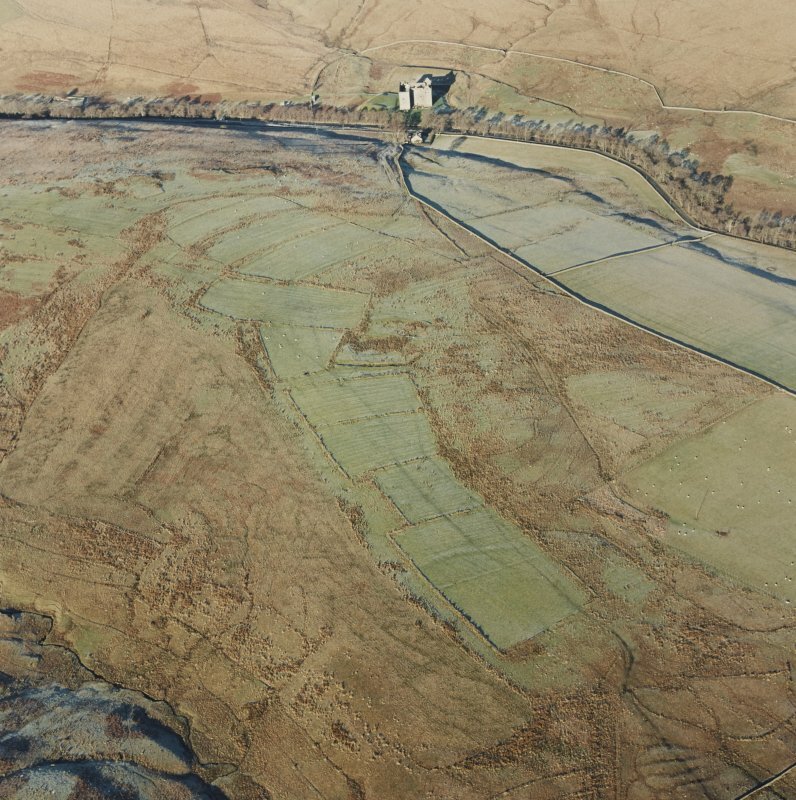 Following the work, the date and nature of the track is still essentially unclear, but the deposits disturbed are likely to date after the restoration of the monument, to the 19th and 20th centuries. 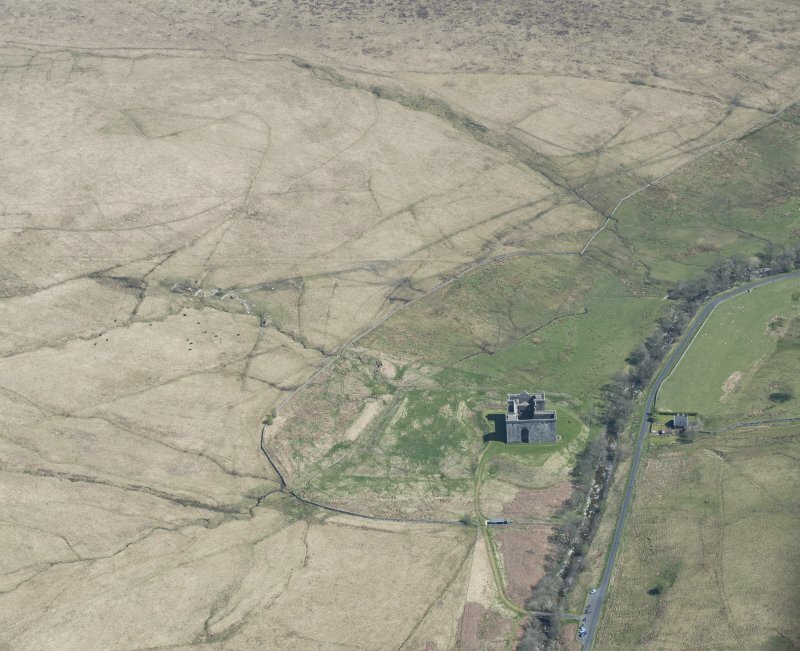 No deposits of archaeological interest were disturbed by the excavation of the drainage channels. NY 4967 9604 A watching brief was maintained in February 2006 while a foundation pad was excavated for the forthcoming installation of access stairs within the property. 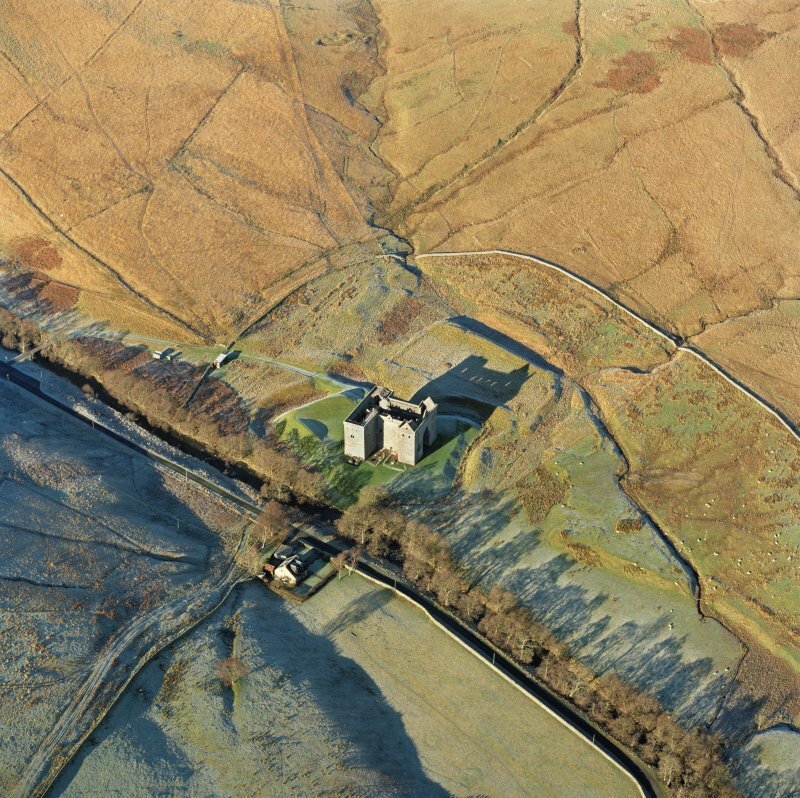 The interior of the castle has been subject to some modern alteration to ground levels. 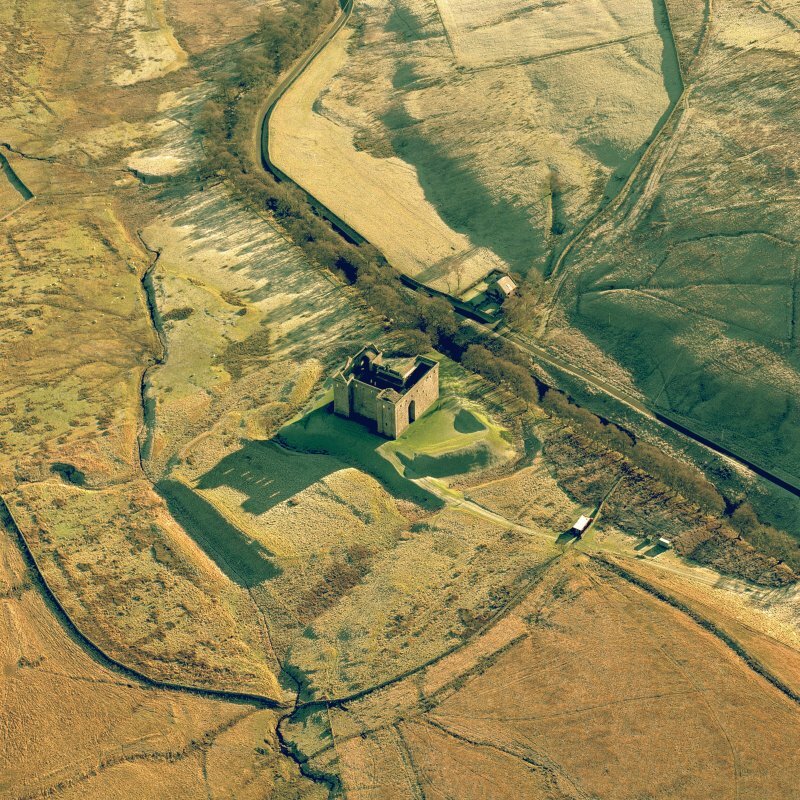 This could be seen in the re-deposited gravelly clay which dominates this area of the castle. 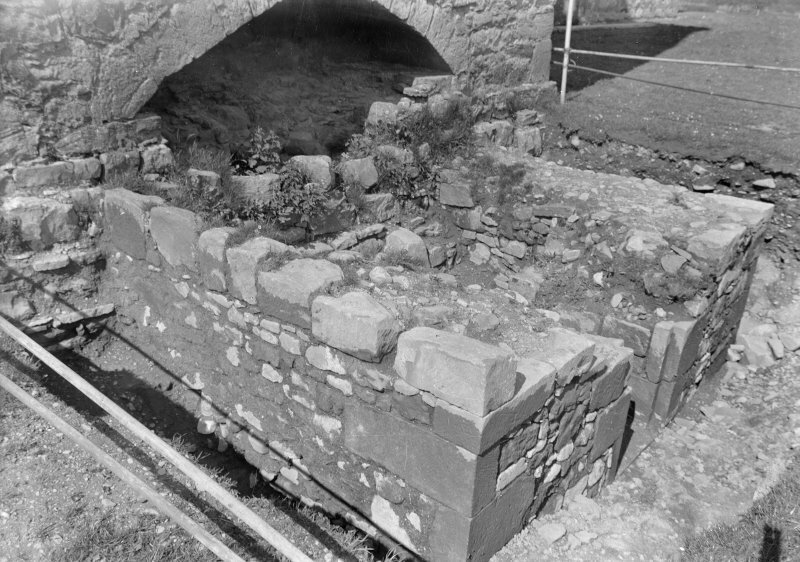 The exposed masonry seen has no archaeological significance and is merely the remains of a previous footing for an earlier wooden staircase. The depth of the trench was not sufficient to encounter any underlying archaeological deposits. 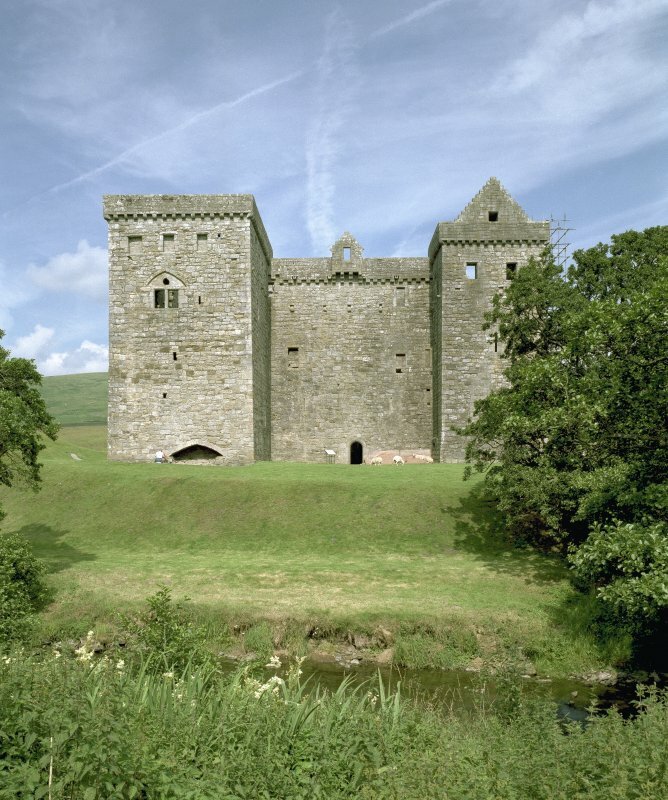 Hermitage is the most perfect of the medieval Border castles, even though heavily restored early in the 19th century. 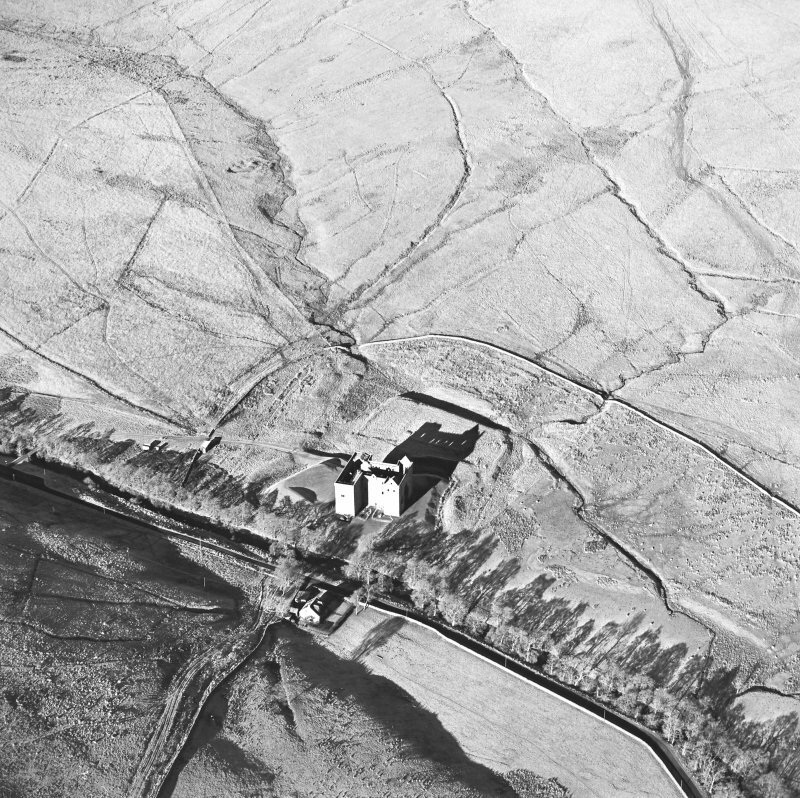 Standing amongst high hills, on the banks of the Hermitage Water, it was described in the mid 16th century as -"a oulde house not stronng, but ewill to be wyn by reasone of the strate grounde aboute the same"- the then broken, marshy ground difficult to negotiate in any but the driest weather. 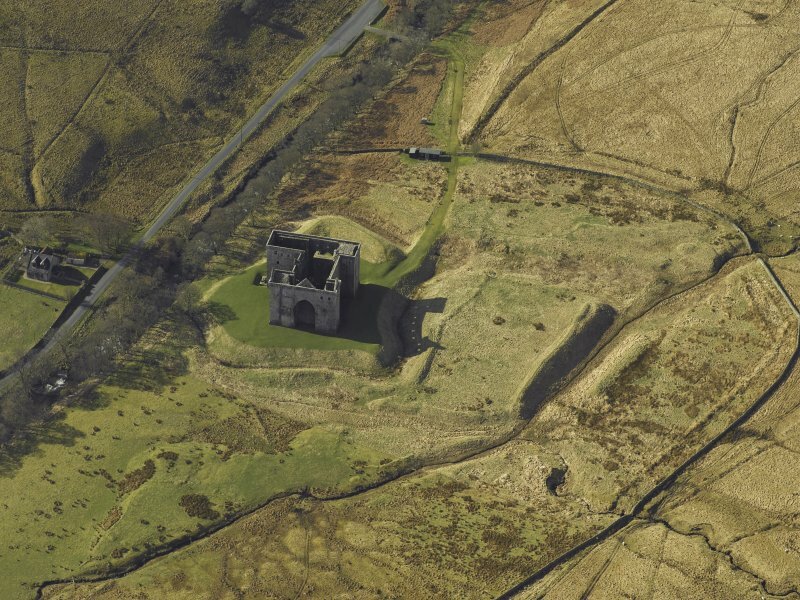 Of a 13th century structure, nothing survives. 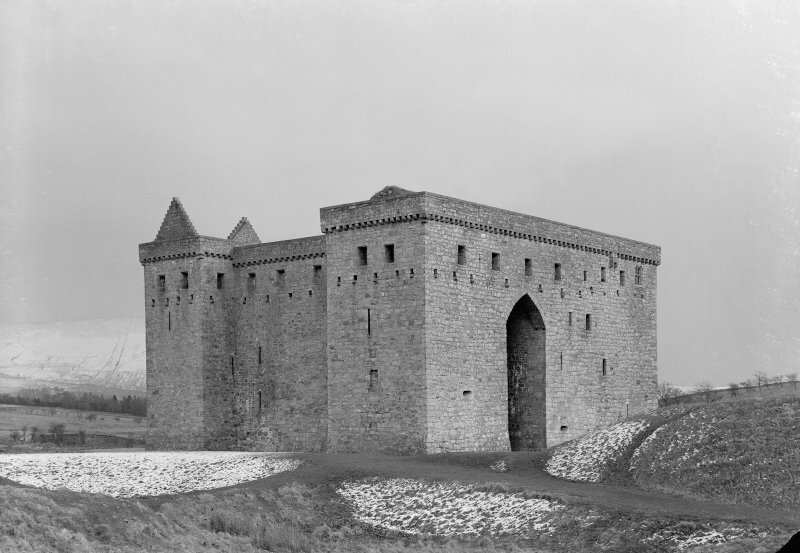 The 14th century castle was rectangular and enclosed the small central courtyard; its entrance was in the south wall; and a turnpike stair opposite rose no higher than first-floor level. 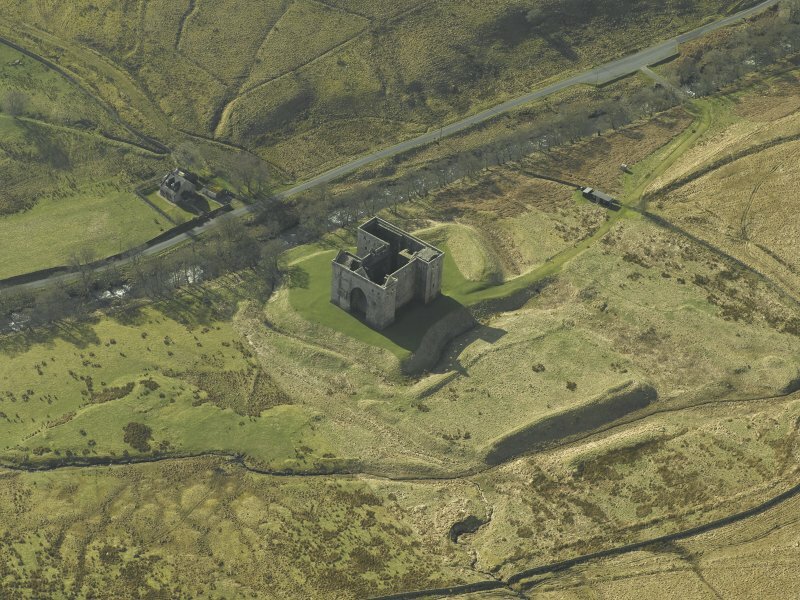 This castle is associated with the Dacres (1358 to at least 1365) and reflects the style of some 14th century, northern English fortified manorhouses. Some of the surviving, well-dressed red sandstone masonry bears masons' marks-distinctively large, well-cut and Gothic in the 14th century manner. 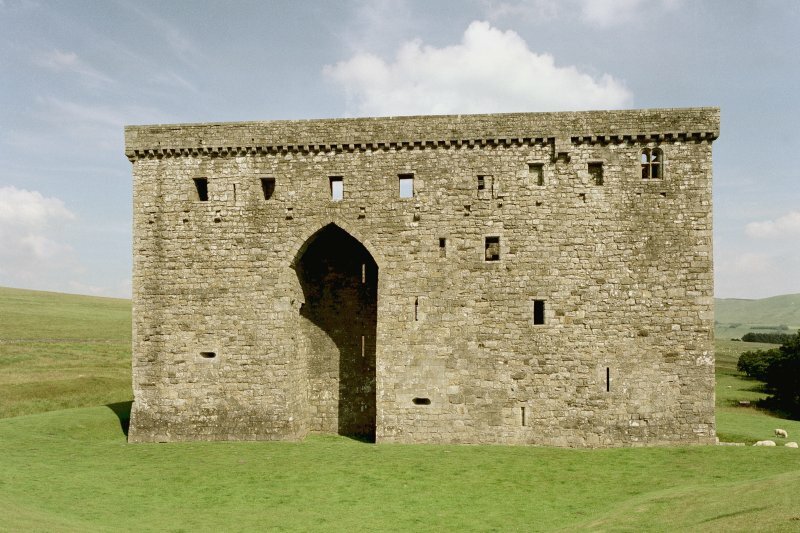 Towards the end of the 14th century a rectangular tower-house incorporated the earlier features, and subsequently massive rectangular towers were added to all but the south-east corner of the keep. 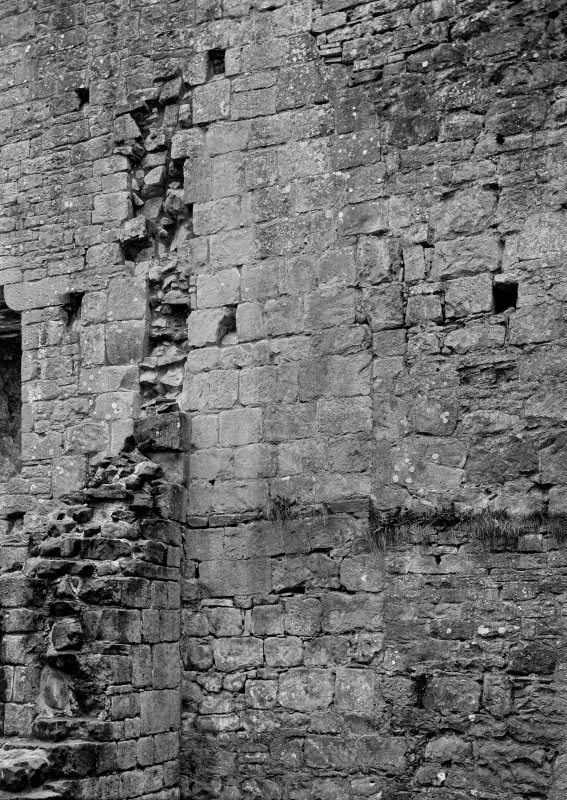 This latter succumbed in due course, when a further massive tower enveloped the short wing or 'jamb' of the late 14th century keep-traces of whose entrance and protective portcullises, above ground-level, survive internally. 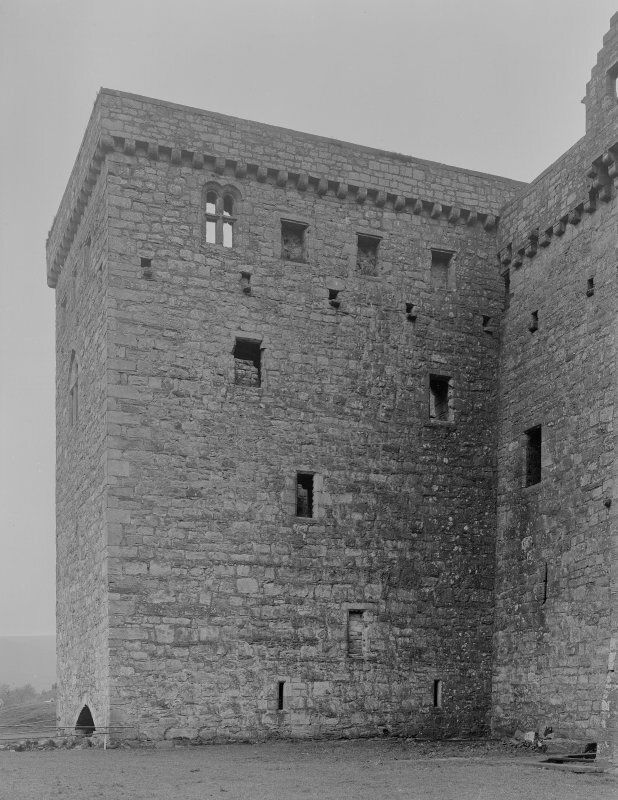 The 'new, four-storey castle was topped by a projecting battlement below which, to the outside, ran a continuous wooden hoarding supported on corbels and accessible through rectangular openings easily visible high up in the walls. In the 16th century, when firearms came to be used for defence, a few wide-mouthed, oblong gun-loops were added to the outer walls. 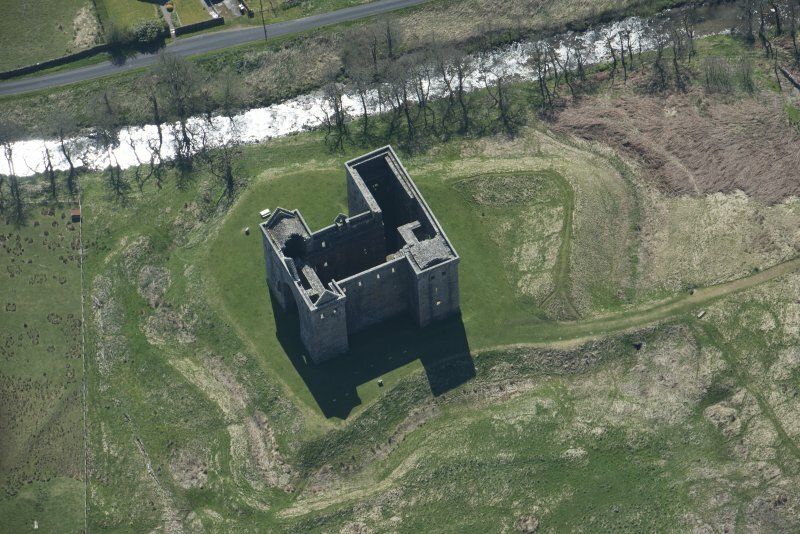 Hermitage is a magnificently solid, gaunt castle where Mary, Queen of Scots, visited the seriously injured Bothwell in 1566. 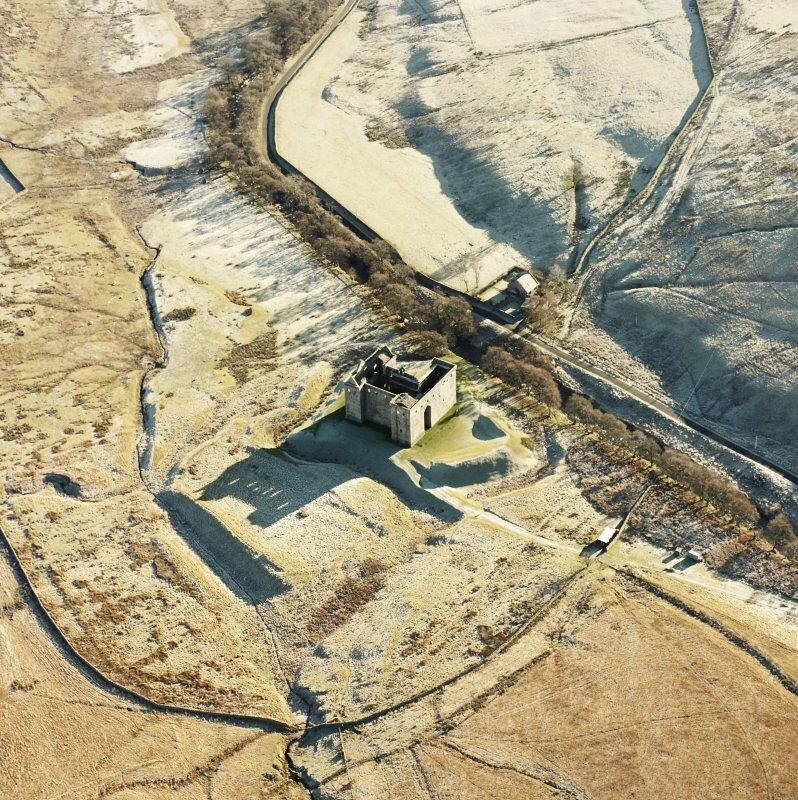 About 370m west lie the ruins of a small chapel, probably 14th century and set within a graveyard, amidst a series of earthworks. 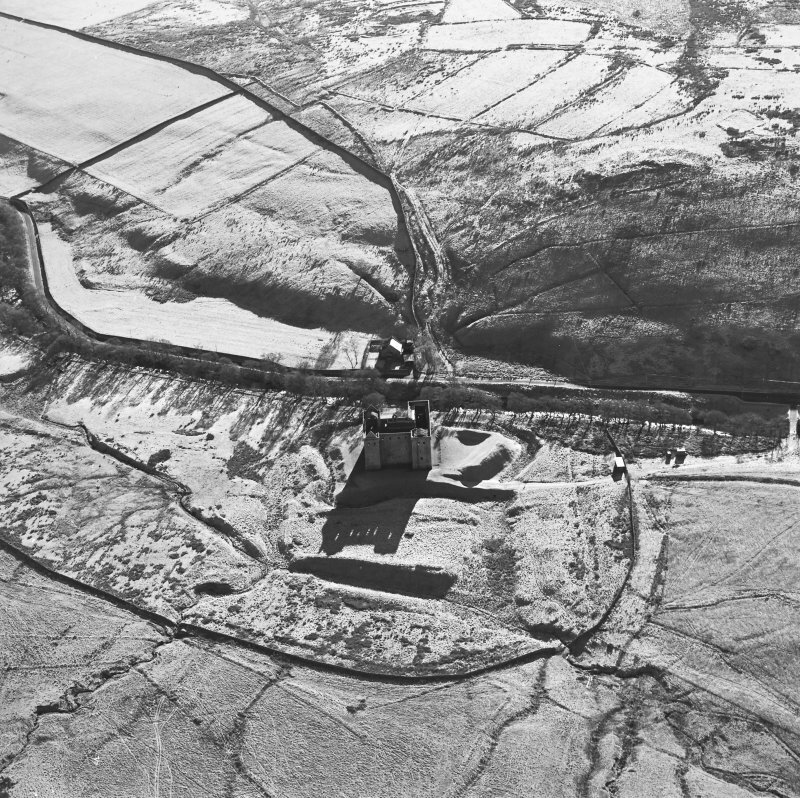 Enclosed fields and a hollow track lie up the hillside; the churchyard more or l~ss fills one set of enclosures; further earthworks lie to the west. 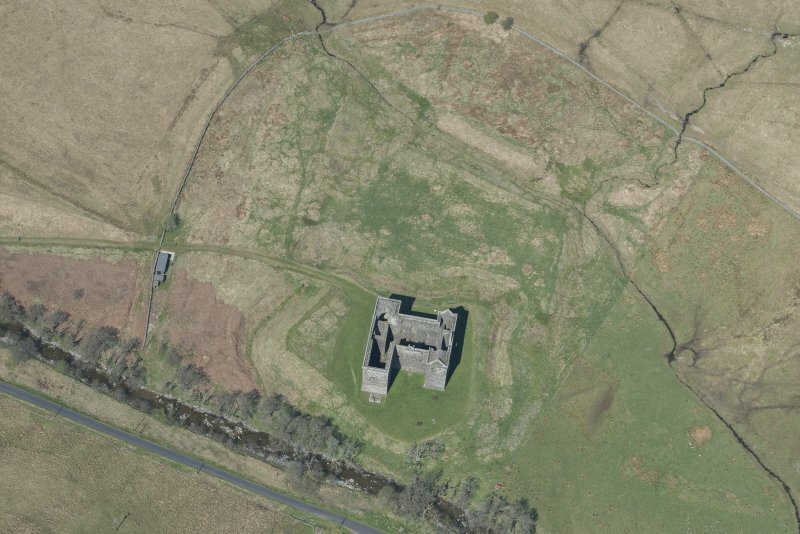 Could the churchyard be the site of the first castle recorded in 1242-44, with a western outer bailey? 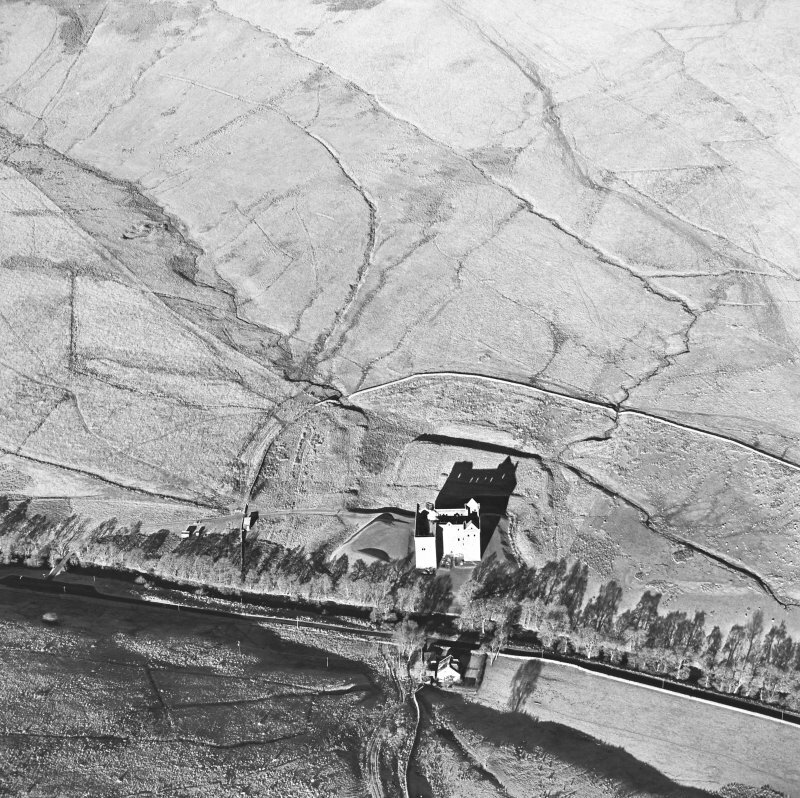 Or do the earth works reflect a moated homestead possibly of c1300? 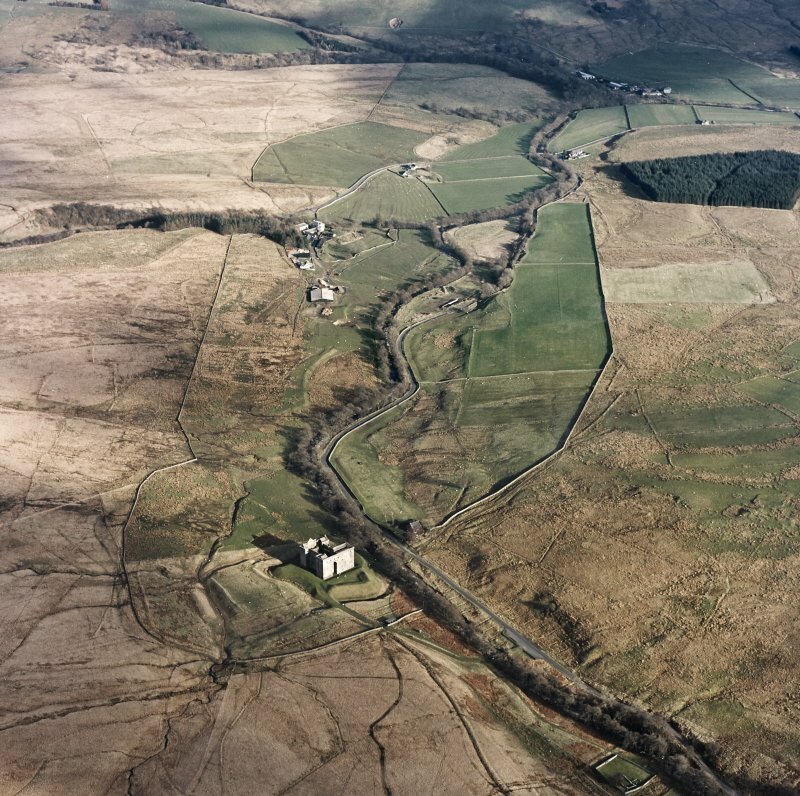 Between the burial ground dyke and the river stands the low mound 'Cout o' Kielders Grave' - traditionally the grave of Sir Richart Knout (or Knut) of Kielder, in Northumbrian Tynedale, who died between 1289 and 1291. 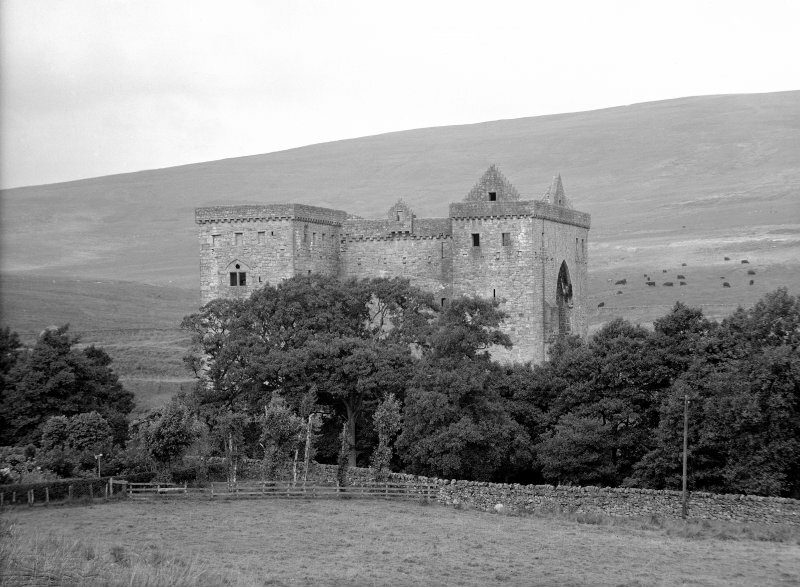 The cutting of channels for drainage pipes over the track leading to Hermitage Castle was monitored. 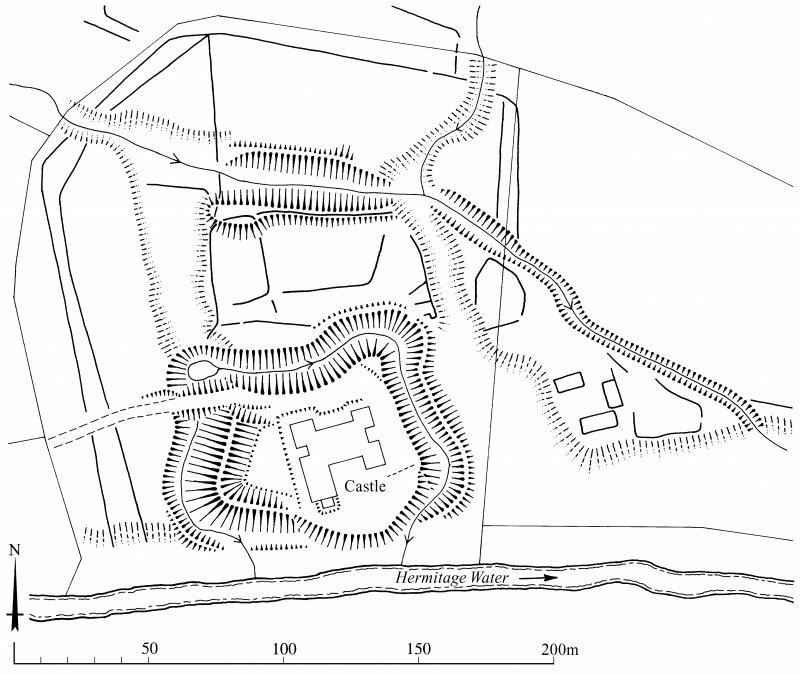 Although the area to be monitored was not within the immediate area of the surviving castle, the extensive earthworks around the castle, which makes use of a defensive earthworks c 400m to the W, and a possible settlement beyond this, all indicate that the general area is of great archaeological interest. NY 4967 9604 A watching brief was maintained in February 2006 while a foundation pad was excavated for the forthcoming installation of access stairs within the property. 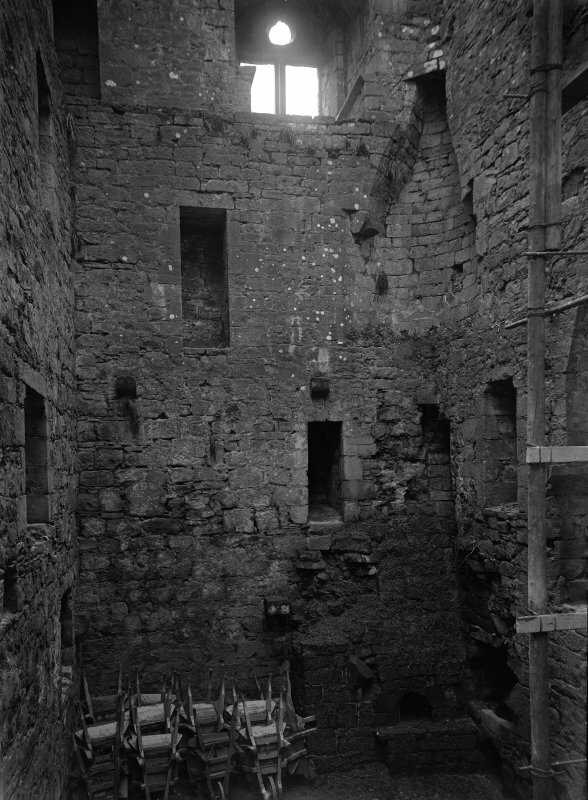 The interior of the castle has been subject to some modern alteration to ground levels. 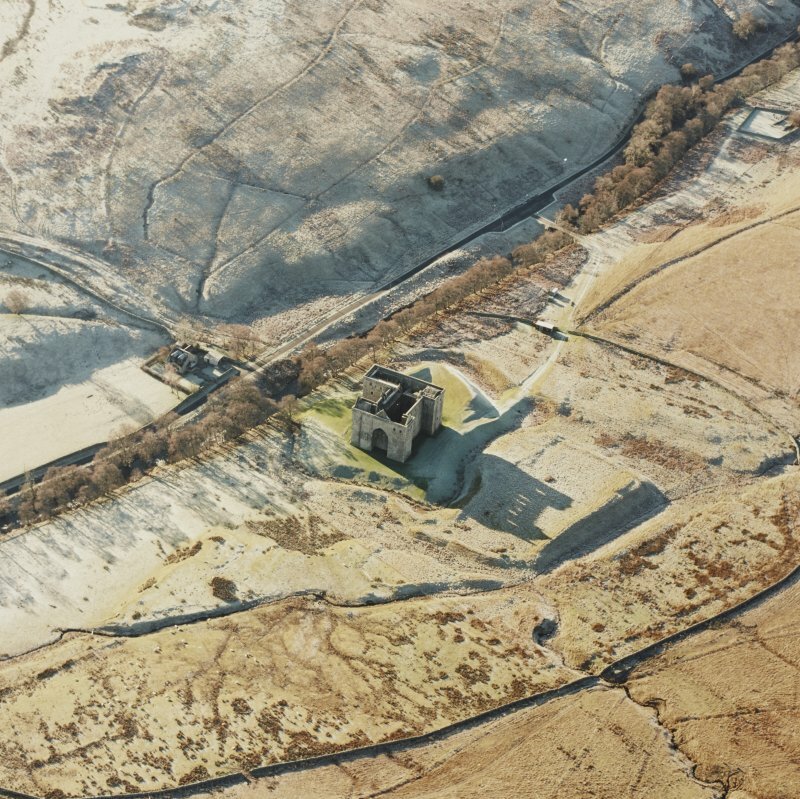 This could be seen in the re-deposited gravelly clay which dominates this area of the castle. 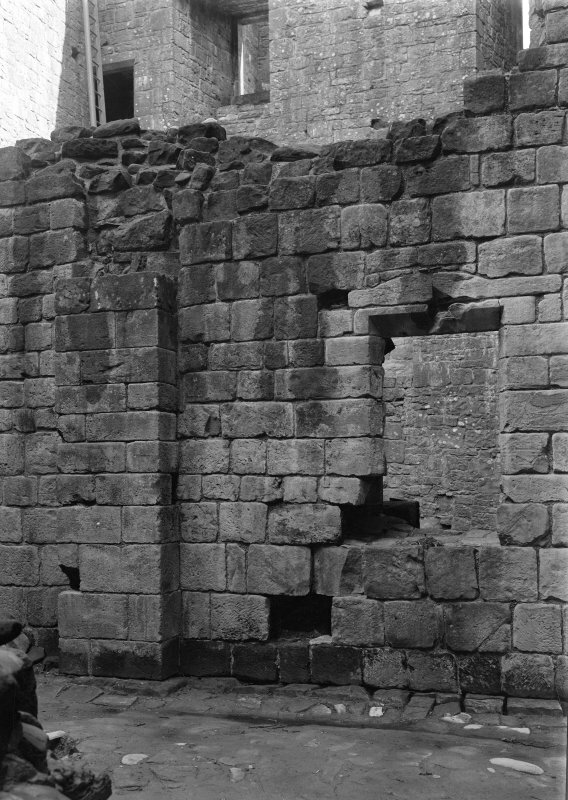 The exposed masonry seen has no archaeological significance and is merely the remains of a previous footing for an earlier wooden staircase. The depth of the trench was not sufficient to encounter any underlying archaeological deposits. NY 49675 96047 (NY49NE 5) An inventory of this collection of 48 pieces was undertaken, July – September 2015. The castle collection includes a number of stones that probably came from the chapel, and further chapel stones have been set up beside the chapel itself, a short walk from the castle. Stones that relate to castle doorways are represented in the collection, including a jamb and a voussoir, and stones of a similar type can still be seen in courtyard doorways. 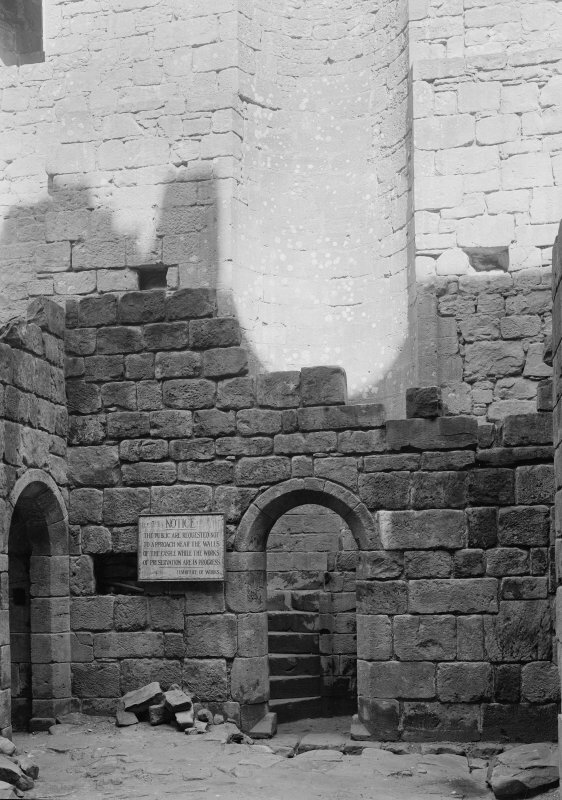 Chapel stones include a cross-slab, and a significant group of window arches, jambs and sills, many of which have been rebuilt in a group of three pointed-arch windows adjacent to the remains of the chapel. Two pieces of window tracery also remain in the collection, each of which comes from the junction of a window arch with an angled bar of tracery. Glazing checks are cut in the reveals, and they are linked by virtue of the moulding profiles to other window stones on display.